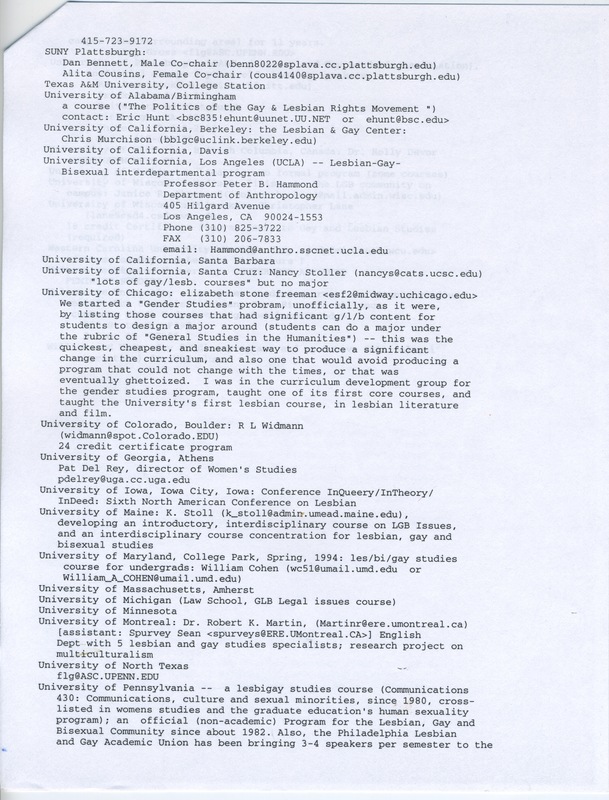 A list of university gay studies programs compiled by Bruce J. Mcdonald in September 1994 and printed by Julia Bryan-Wilson c. 1995, while she was at work as a secretary at Oregon Health and Sciences University. 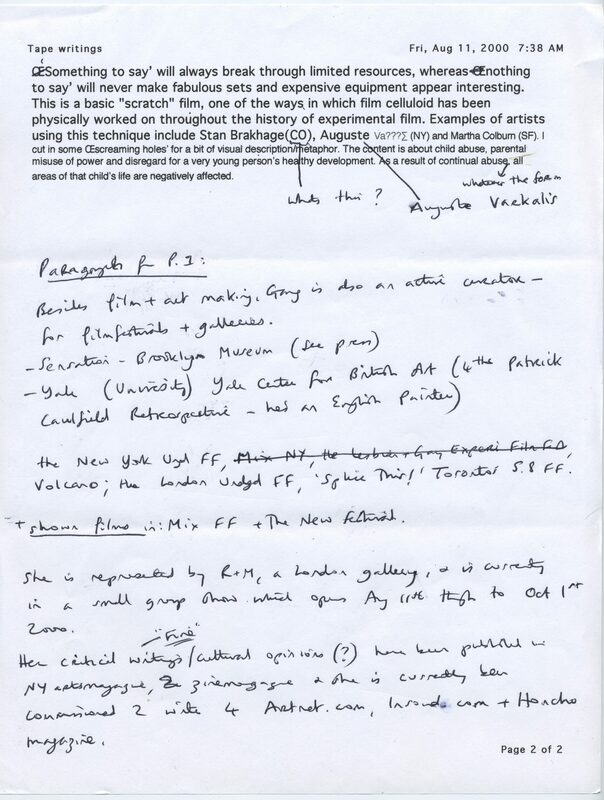 Bryan-Wilson’s handwritten notes recommend that Miranda July contact these programs for Big Miss Moviola, “Also all English, Film/Video, Women’s Studies, and Art programs.” Page 1. 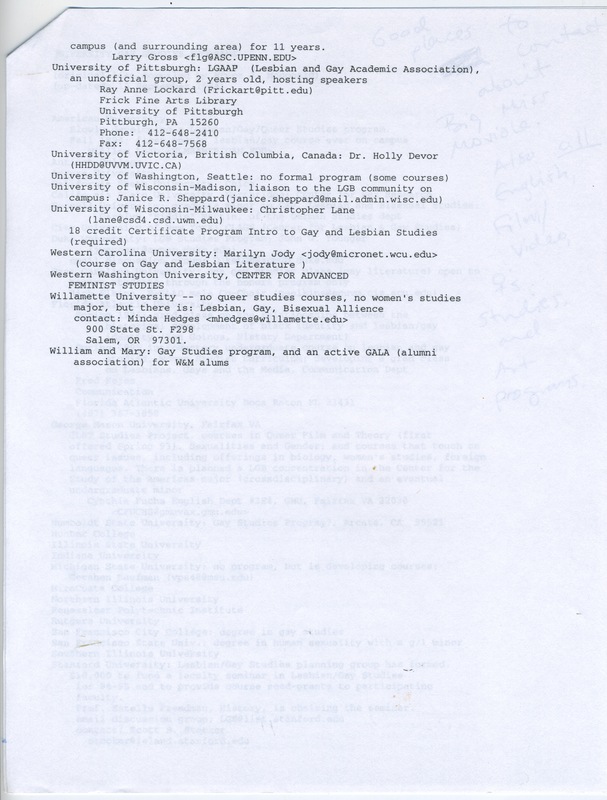 A list of university gay studies programs compiled by Bruce J. Mcdonald in September 1994 and printed by Julia Bryan-Wilson c. 1995, while she was at work as a secretary at Oregon Health and Sciences University. 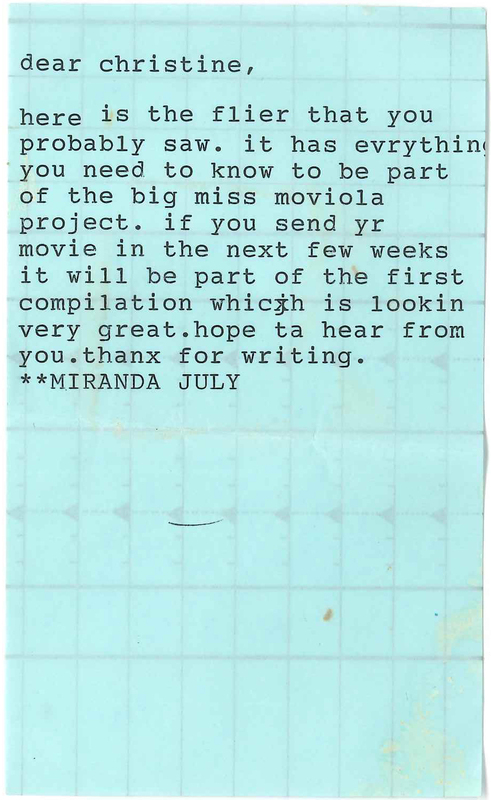 Bryan-Wilson’s handwritten notes recommend that Miranda July contact these programs for Big Miss Moviola, “Also all English, Film/Video, Women’s Studies, and Art programs.” Page 2. 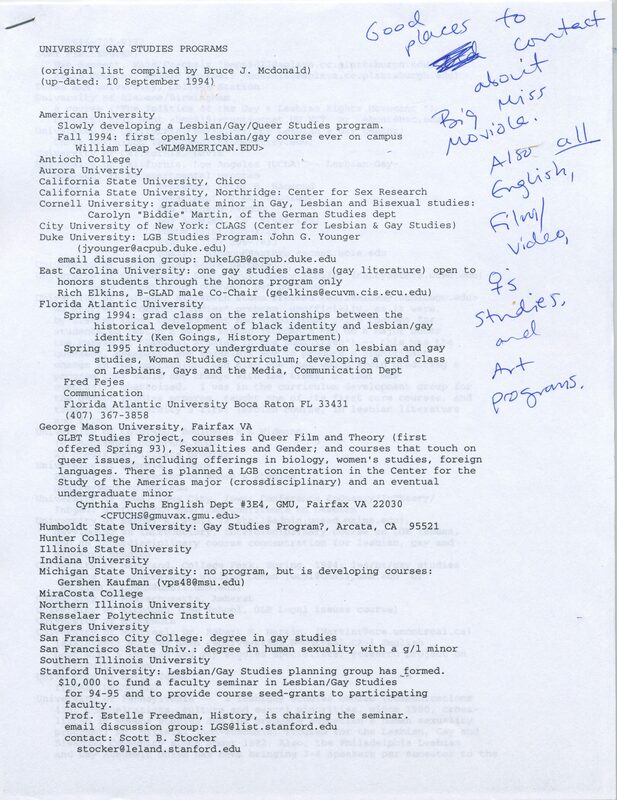 A list of university gay studies programs compiled by Bruce J. Mcdonald in September 1994 and printed by Julia Bryan-Wilson c. 1995, while she was at work as a secretary at Oregon Health and Sciences University. 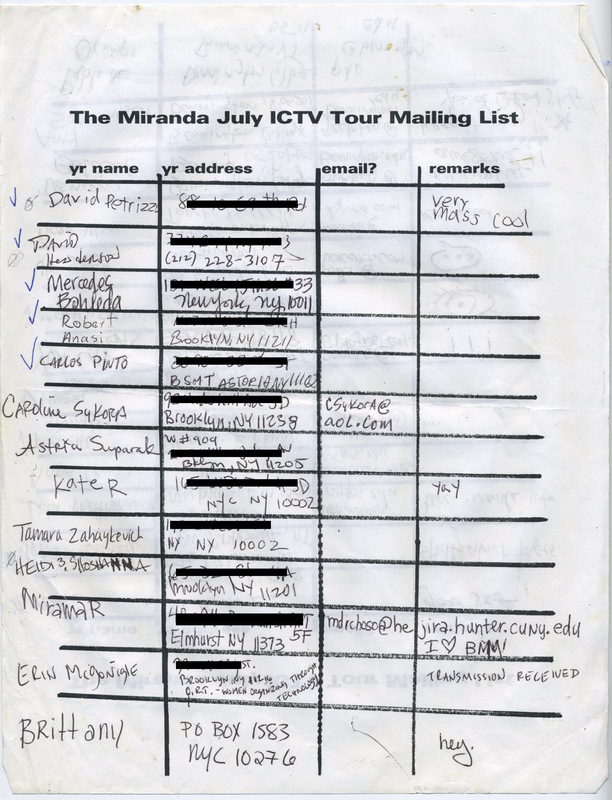 Bryan-Wilson’s handwritten notes recommend that Miranda July contact these programs for Big Miss Moviola, “Also all English, Film/Video, Women’s Studies, and Art programs.” Page 3. 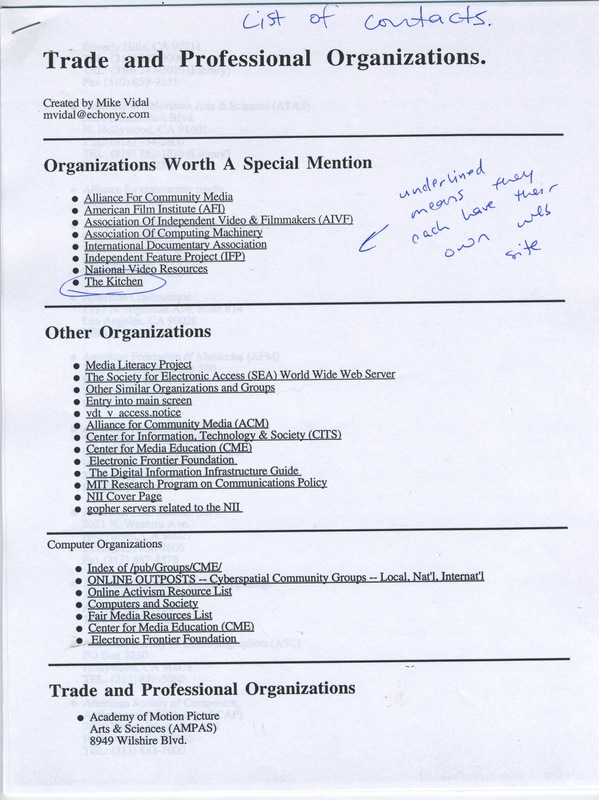 List of media arts organizations and their websites printed by Julia Bryan-Wilson c. 1995, while she was at work as a secretary at Oregon Health and Sciences University. 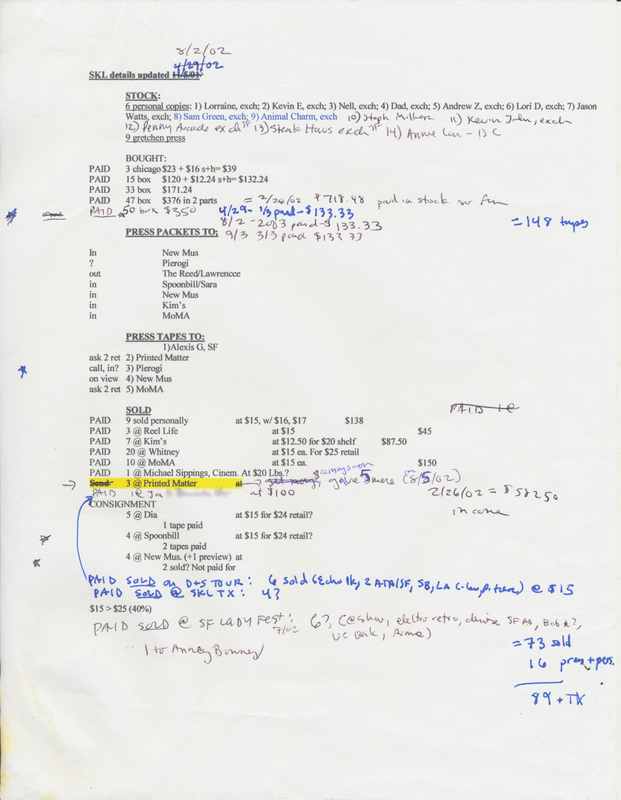 Bryan-Wilson’s handwritten notes at top. 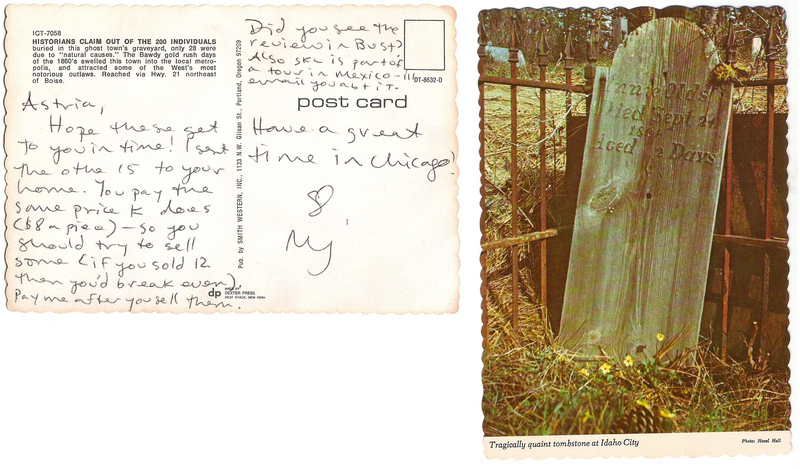 Postcard from Mary Billyou, filmmaker in The Velvet Chainletter, to Miranda, back. April 25, 1995. 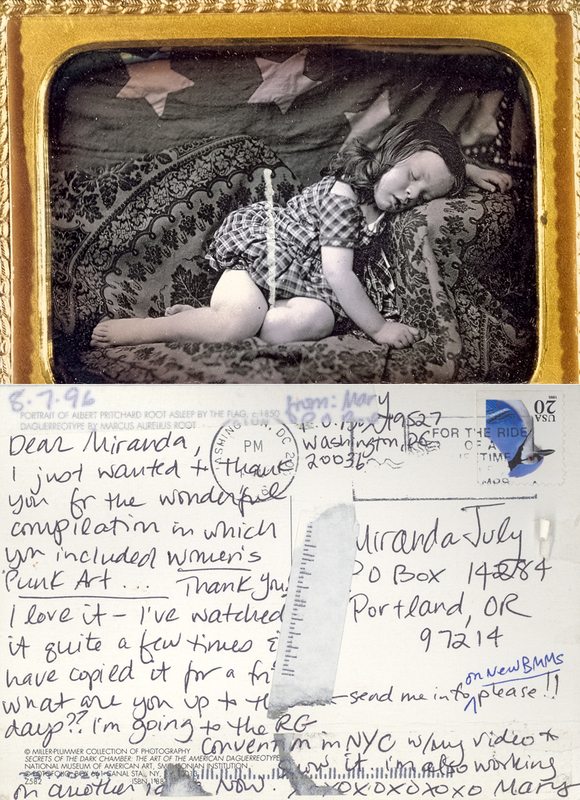 Postcard from Mary Billyou, filmmaker in The Velvet Chainletter, to Miranda, front. April 25, 1995. 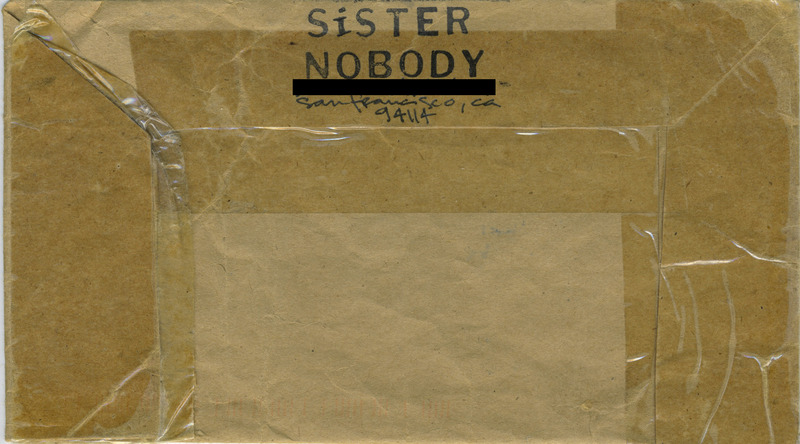 Envelope from Sister Nobody to Miranda, front. October 14, 1995. 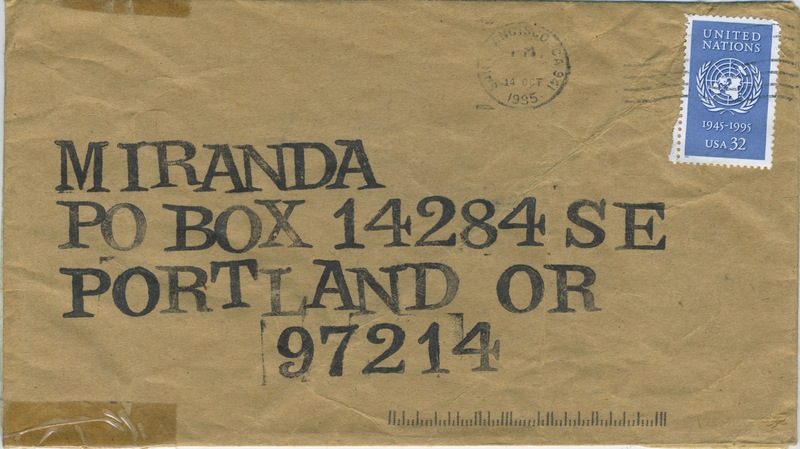 Envelope from Sister Nobody to Miranda, back. October 14, 1995. 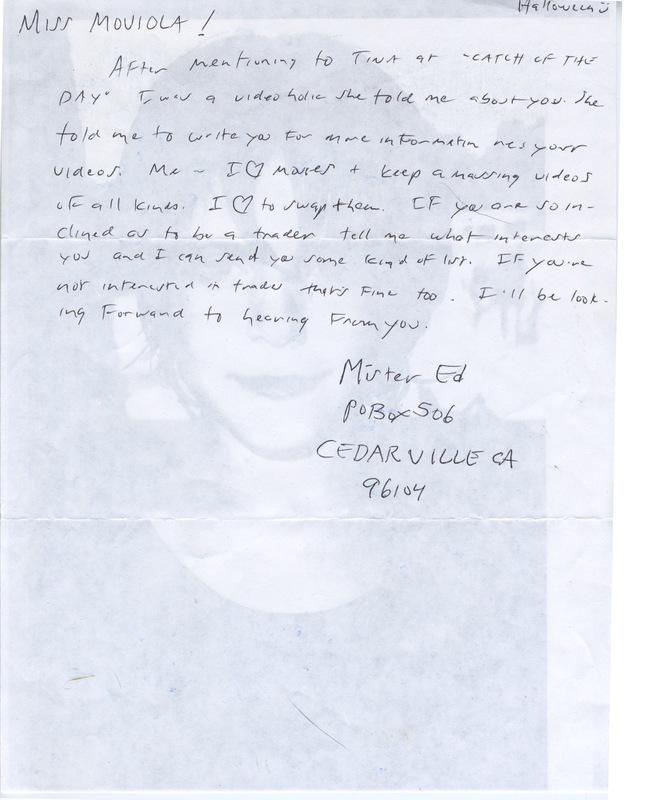 Letter from Miranda July to Christine Kennedy. c. Jan. 22, 1996. From the collection of Christine Kennedy. 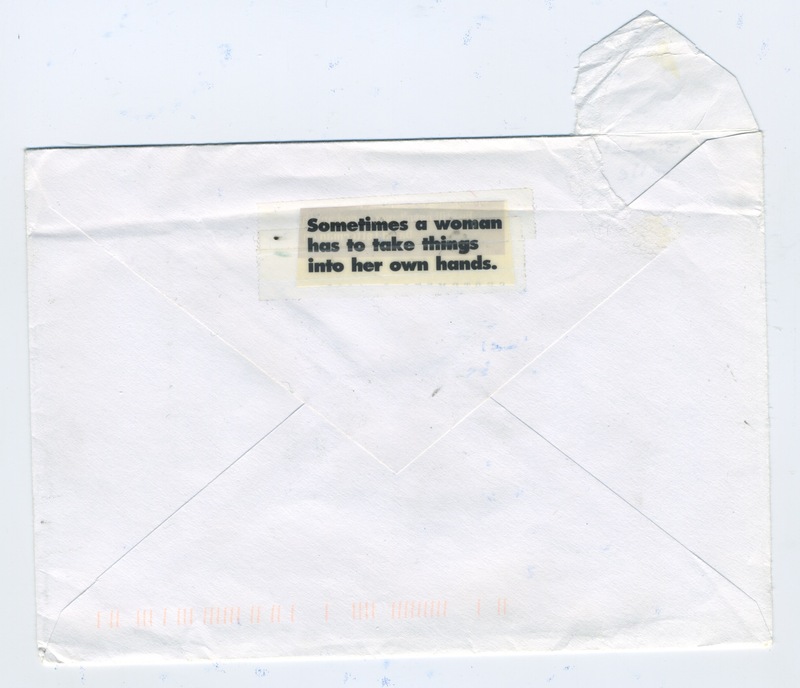 Back of envelope from Miranda July to Christine Kennedy. Jan. 22, 1996. From the collection of Christine Kennedy. Letter from Adnama to Miranda. February 3, 1996. Letter from Mike to Miranda. February 26, 1996. 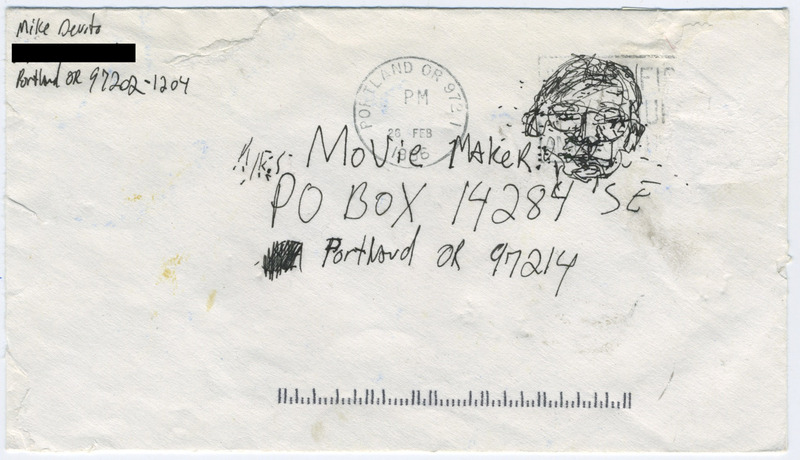 Envelope from Mike to Mrs. Movie Maker. February 26, 1996. Letter from Anna to Miranda. February 29, 1996. 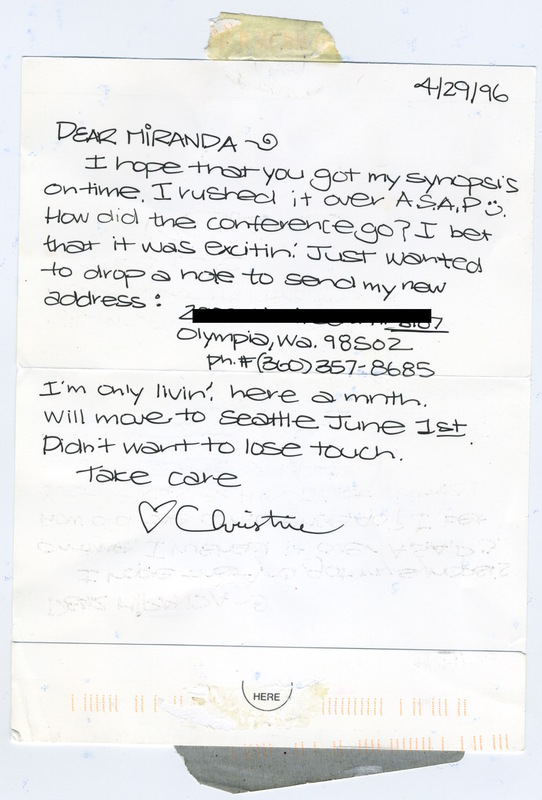 Letter from Christine Kennedy, filmmaker in The Velvet Chainletter, to Miranda. 1996. Page 1. 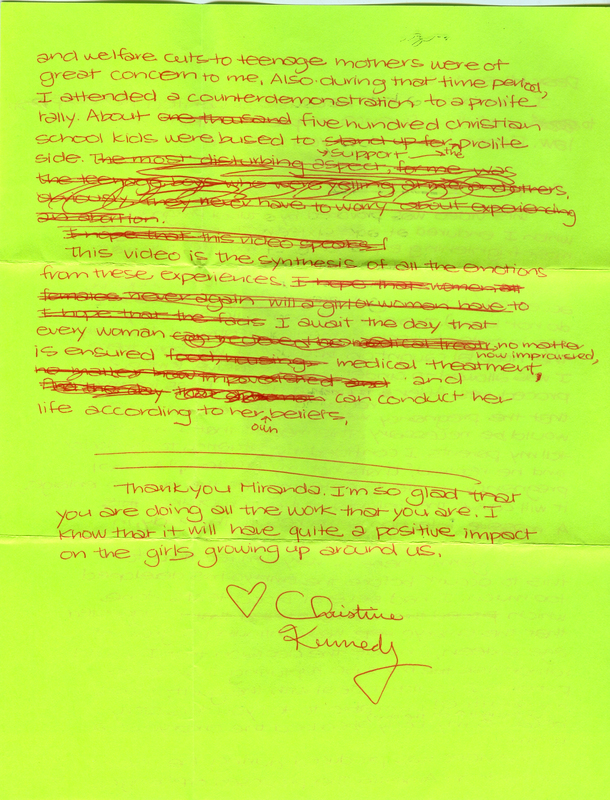 Letter from Christine Kennedy, filmmaker in The Velvet Chainletter, to Miranda. 1996. Page 2. Letter from Kira to Miranda. March 5, 1996. Letter from Jessica to Miranda. April 3, 1996. Letter from Emily to Miranda. April 14, 1996. 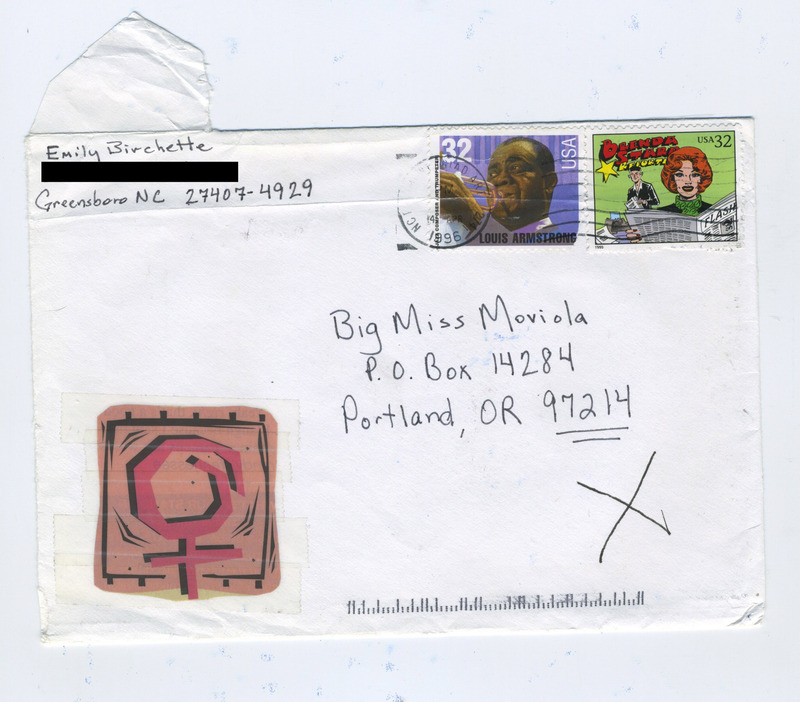 Envelope from Emily to Big Miss Moviola, with tape and paper collage, front. April 14, 1996. Back of envelope from Emily to Big Miss Moviola, with tape and paper collage, back. April 14, 1996. 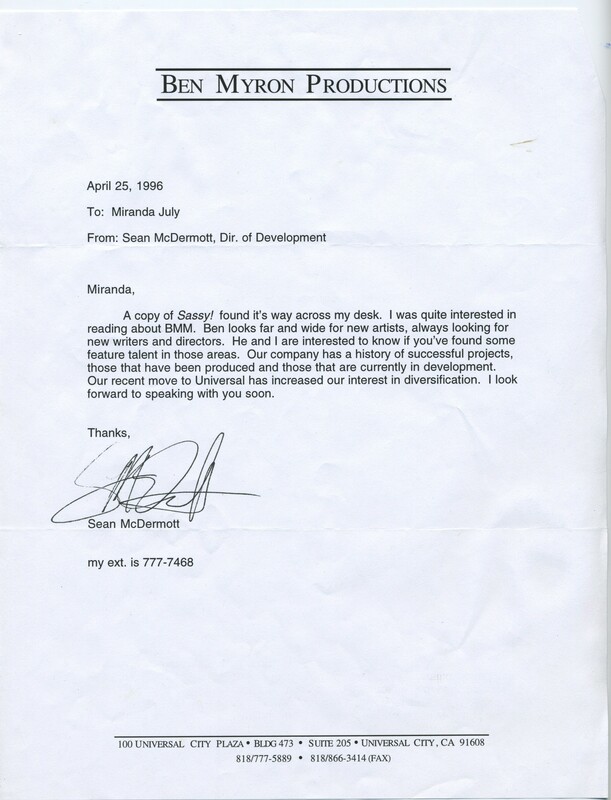 Letter from Sean, Director of Development at Ben Myron Productions, to Miranda. April 25, 1996. 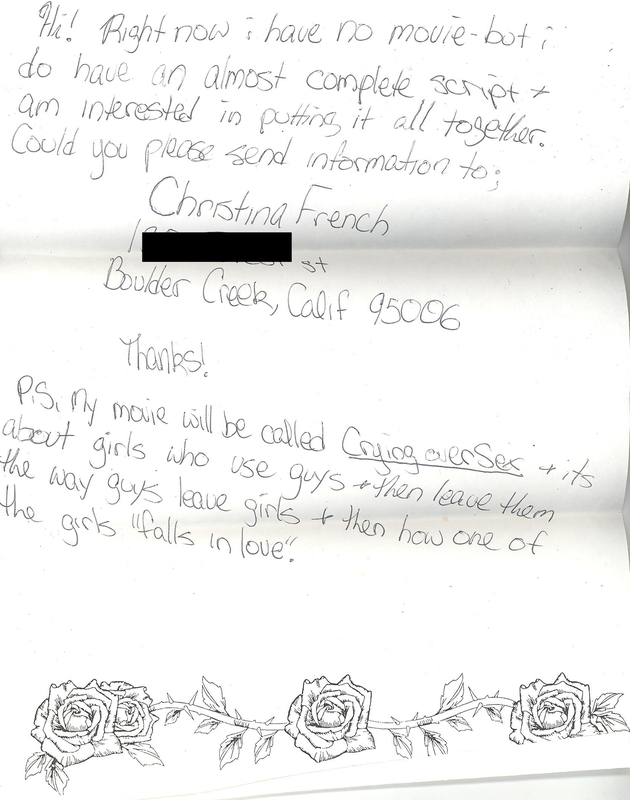 Letter from Christine Kennedy, filmmaker in The Velvet Chainletter, to Miranda, inside. April 29, 1996. 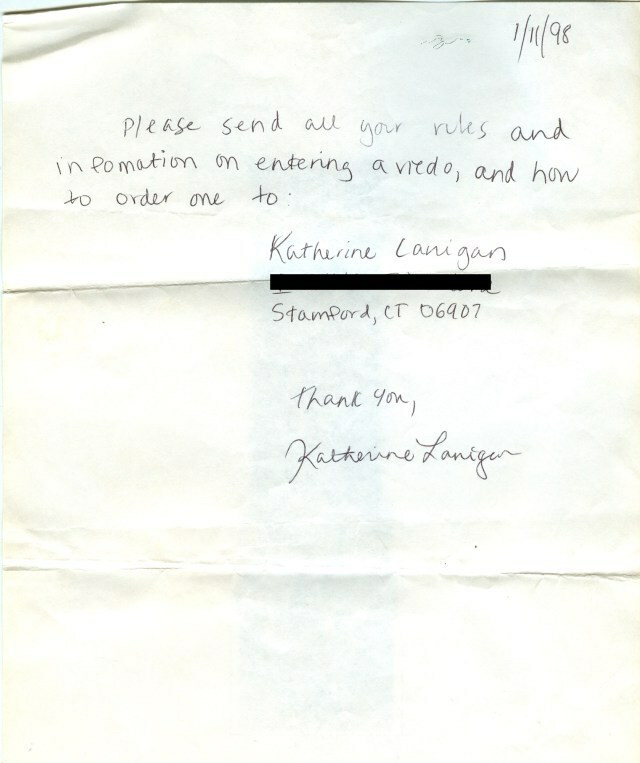 Letter from Christine Kennedy, filmmaker in The Velvet Chainletter, to Miranda, outside. April 29, 1996. 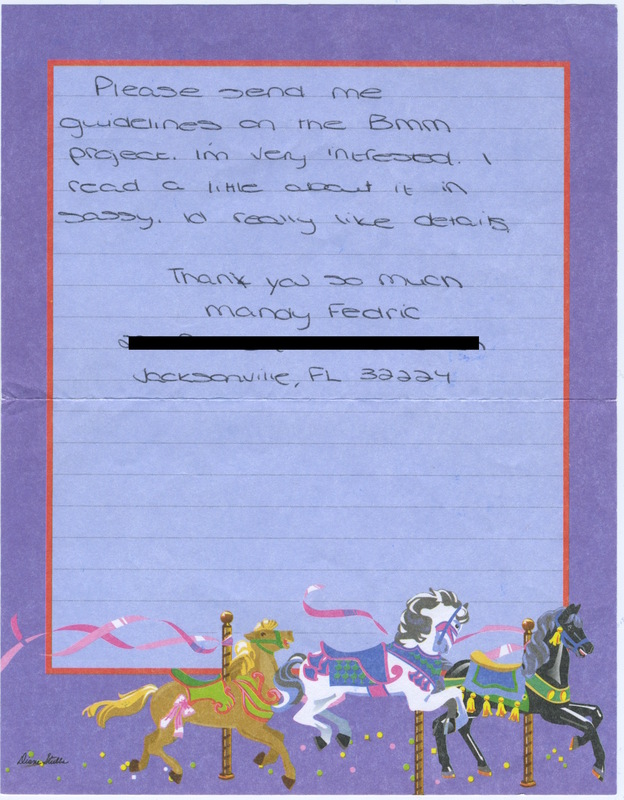 Letter from Alisha to Big Miss Moviola. c. 1996. 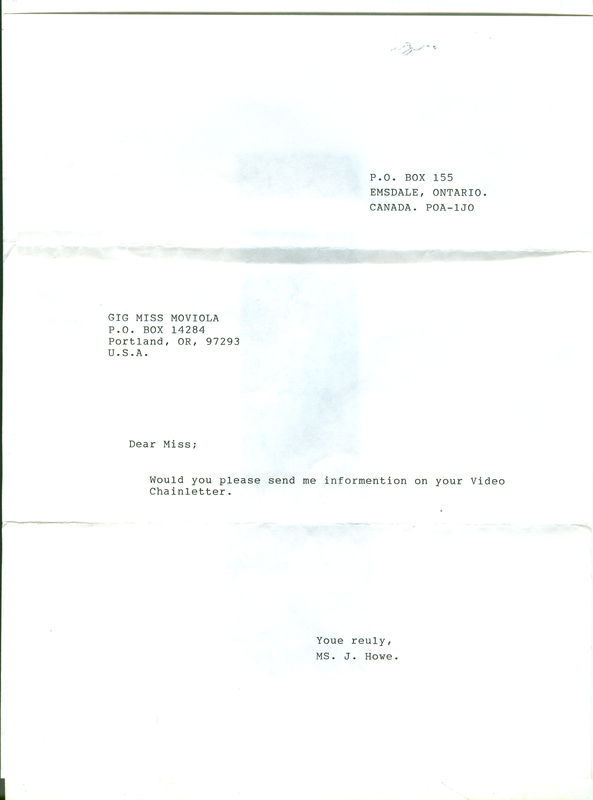 Letter from Christina to Big Miss Moviola. c. 1996. Letter from Jessy to Miranda. c. 1996. 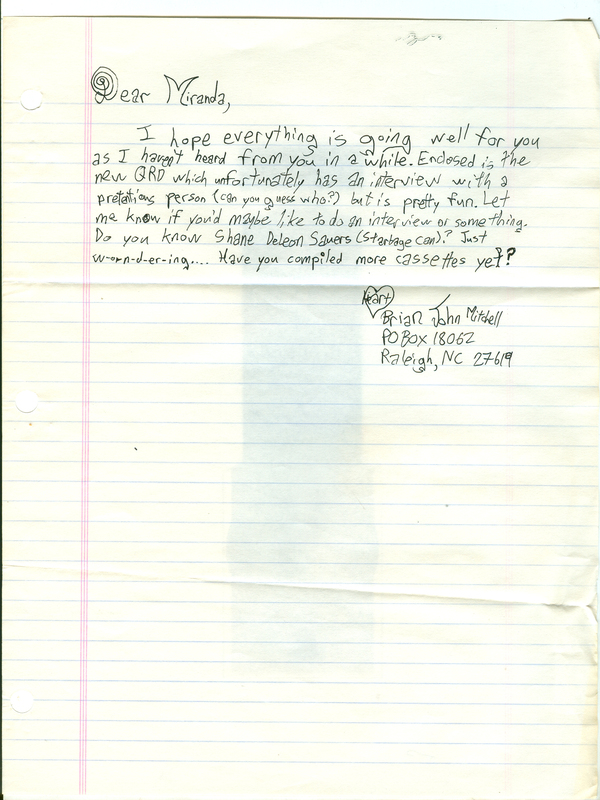 Letter from Dyanne to Big Miss Moviola. 1996. 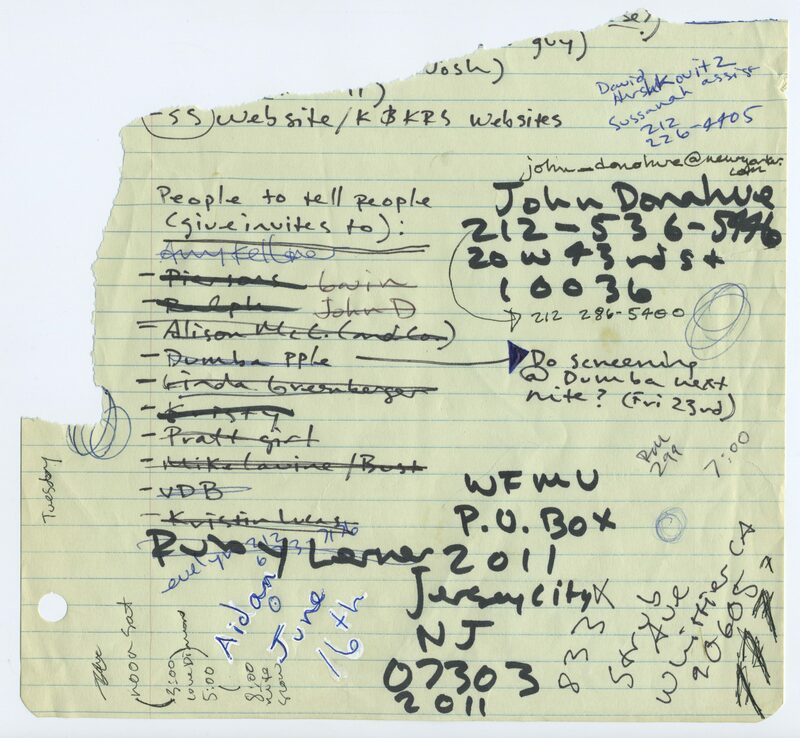 Handwritten list of funding resources probably written at the Portland Public Library by Miranda July. c. 1996. Page 1. 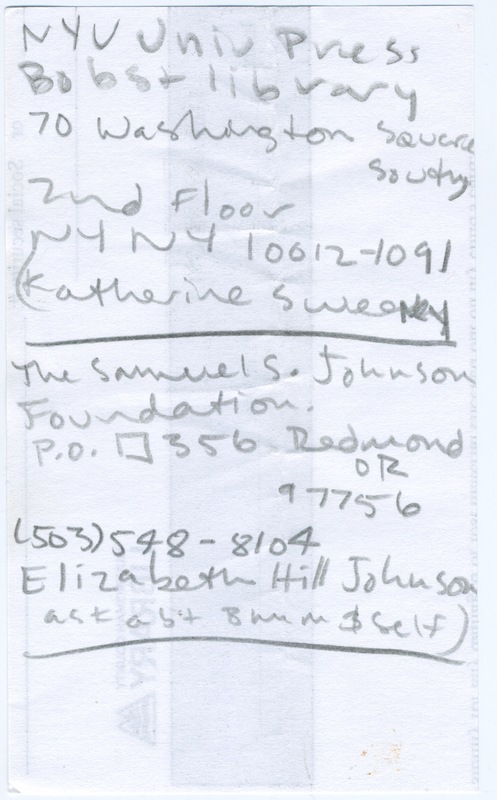 Handwritten list of funding resources probably written at the Portland Public Library by Miranda July. c. 1996. Page 2. 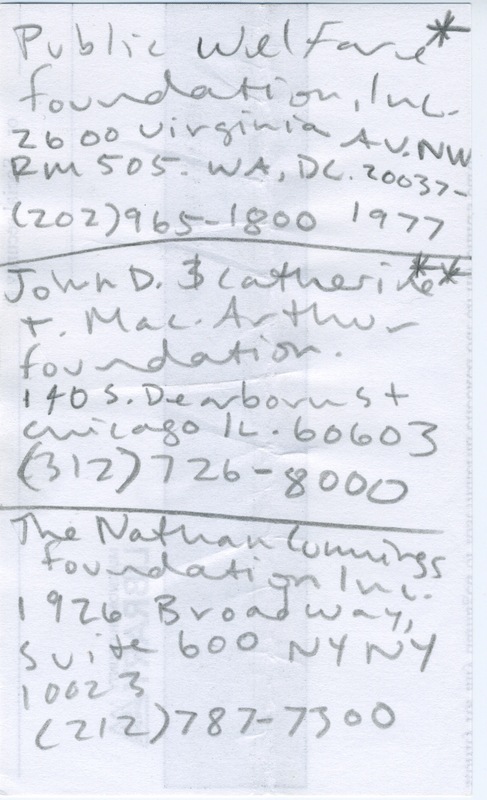 Handwritten list of funding resources probably written at the Portland Public Library by Miranda July. c. 1996. Page 3. 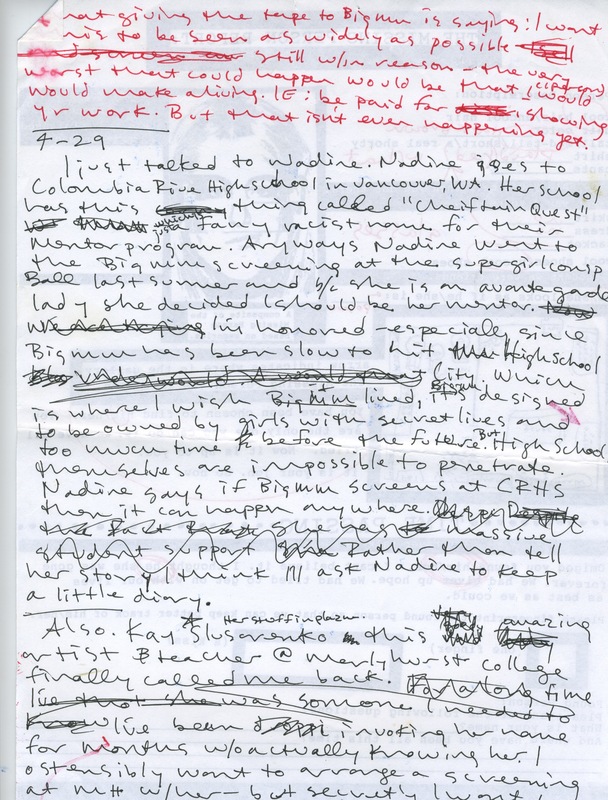 Handwritten list of funding resources probably written at the Portland Public Library by Miranda July. c. 1996. Page 4. 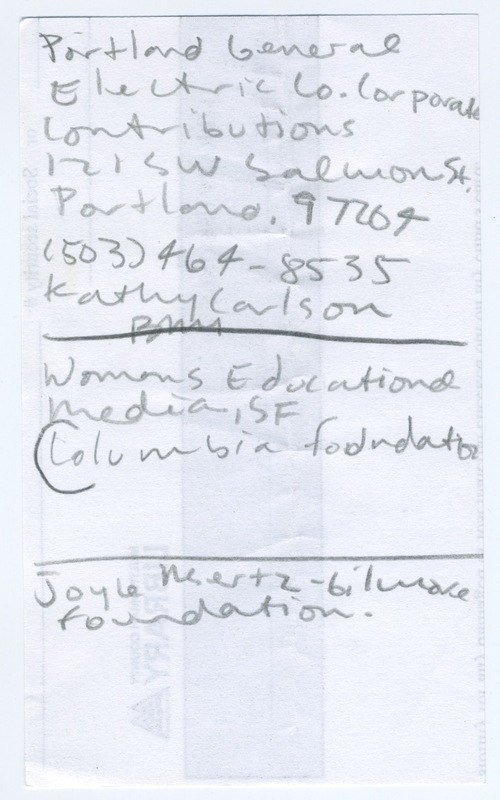 Handwritten list of funding resources probably written at the Portland Public Library by Miranda July. c. 1996. Page 5. Big Miss Moviola mailing list. c. April 1996. Page 1. 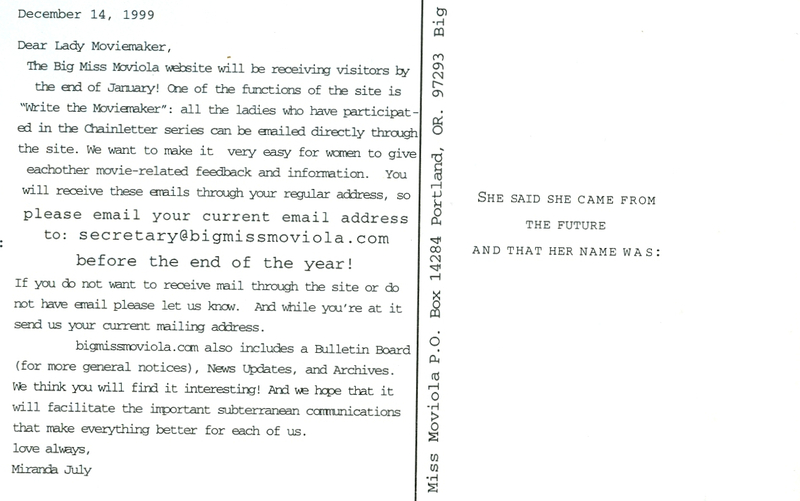 Big Miss Moviola mailing list, probably from a show at Artist’s Television Access. c. 1996. Page 2. Big Miss Moviola mailing list. c. June 1996. Page 3. 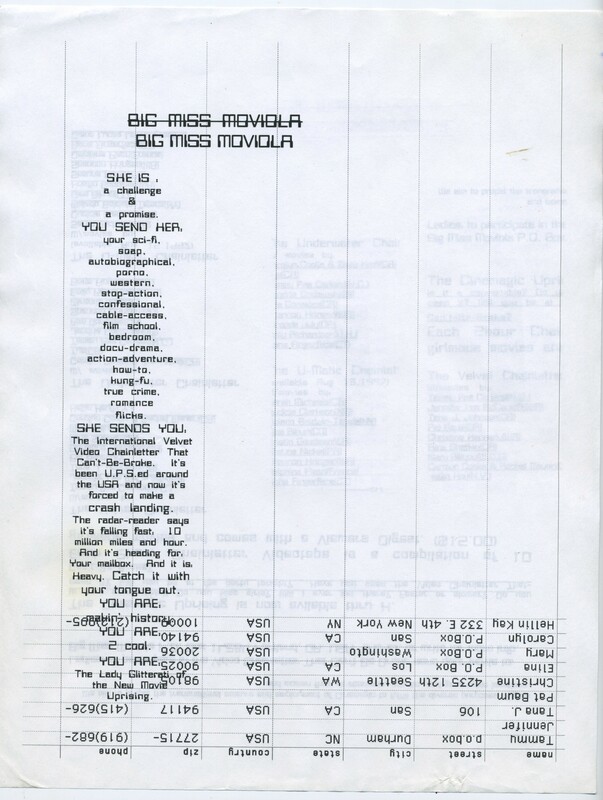 Big Miss Moviola mailing list, possibly from a show at Artist’s Television Access. c. June 1996. Page 4. Big Miss Moviola mailing list. c. October 1996. Page 5. Big Miss Moviola mailing list. c. October 1996. Page 6. Big Miss Moviola mailing list. c. October 1996. Page 7. 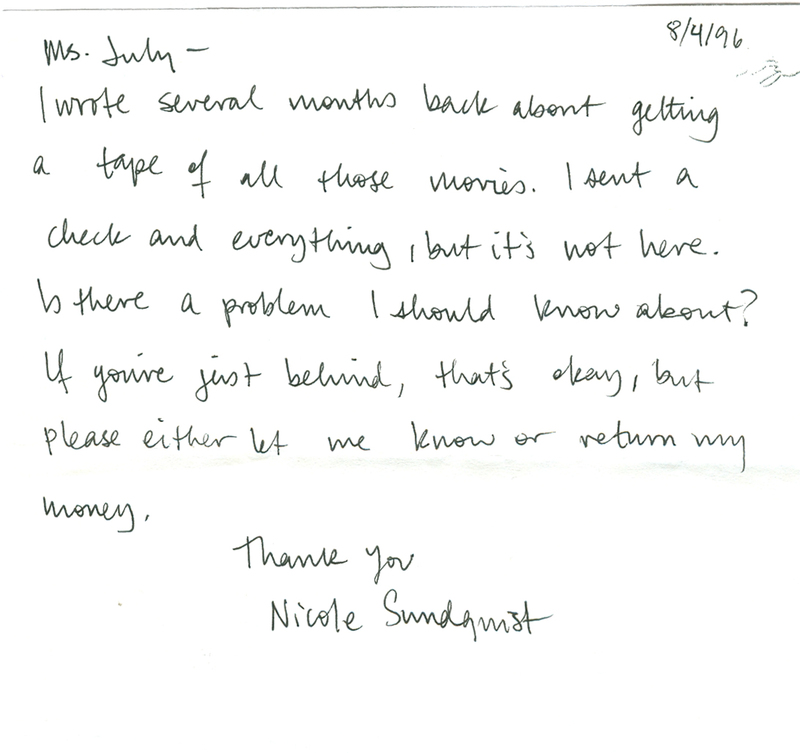 Note from Nicole to Miranda. May 14, 1996. Postcard from Kemoyah to Big Miss Moviola, back. May 17, 1996. 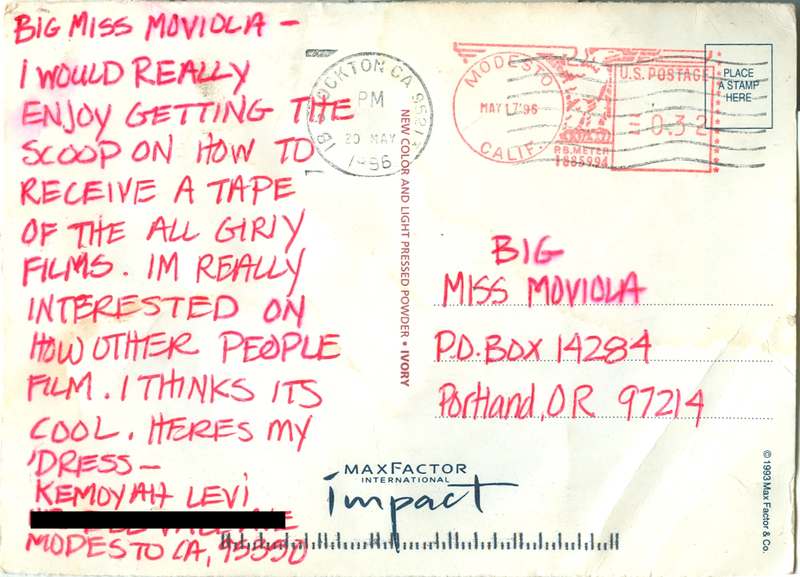 Postcard from Kemoyah to Big Miss Moviola, front. May 17, 1996. 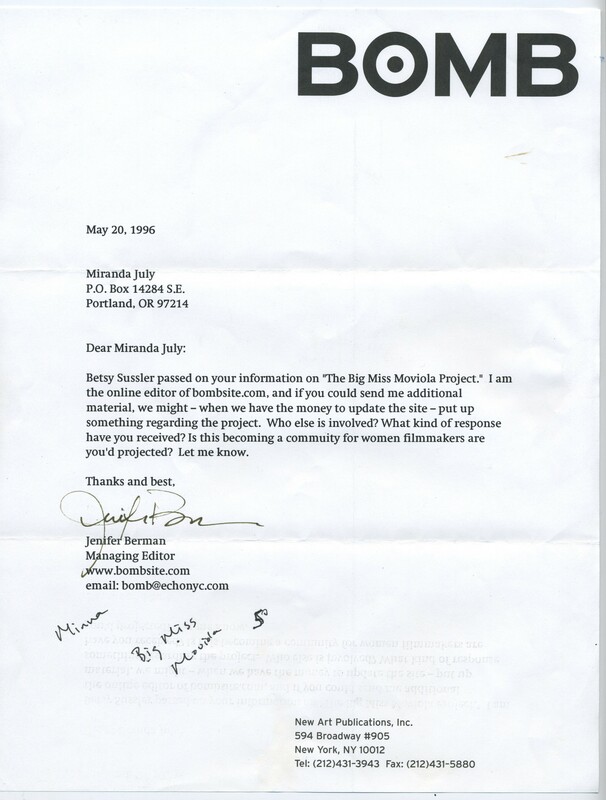 Letter from Jenifer, Managing Editor, bombsite.com (now BOMB) to Miranda. May 20, 1996. 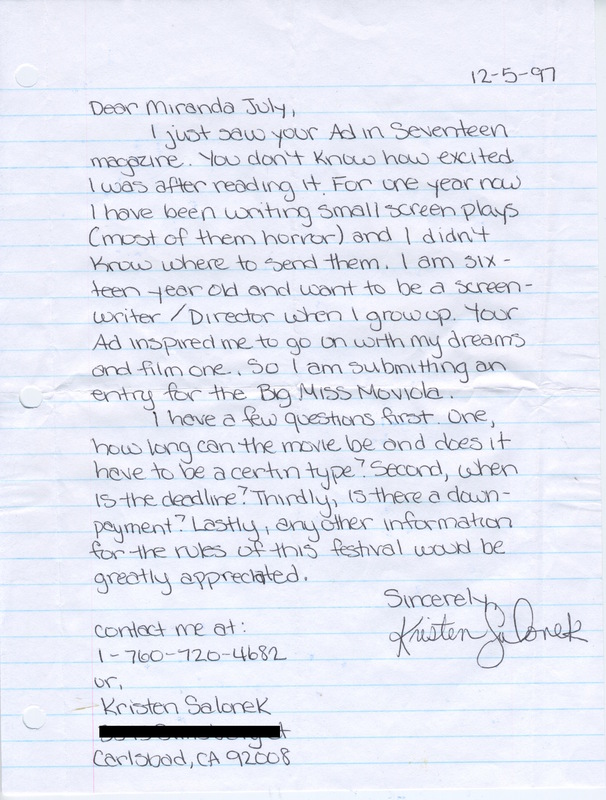 Letter from Christine Kennedy, filmmaker in The Velvet Chainletter, to Miranda. May 29, 1996. 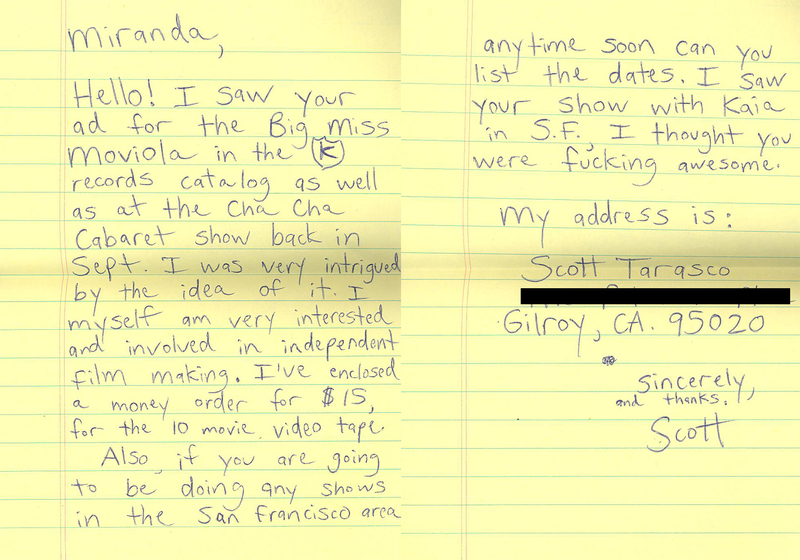 Letter from Mandy to Big Miss Moviola. c. 1996. Folder made to hold college tour press release and letter. 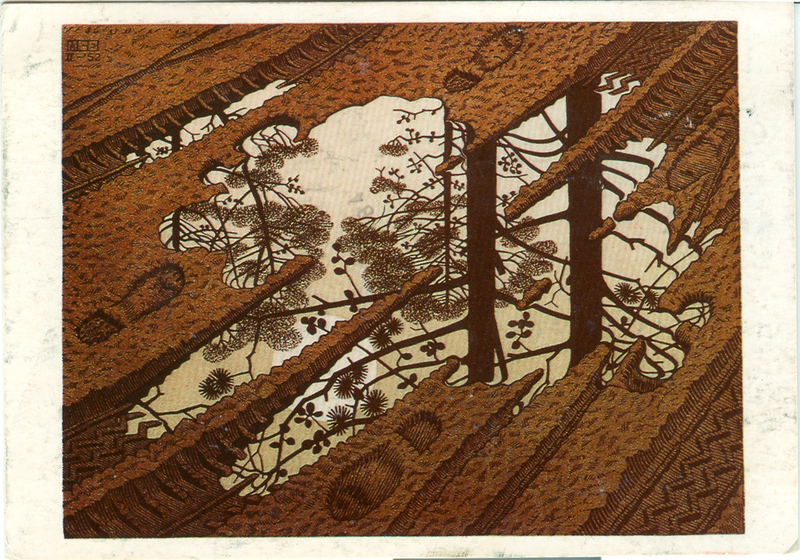 Color Xeroxed paper, 1996. 11″ x 17″, folded in half. Designed by Miranda July and Julia Bryan-Wilson. 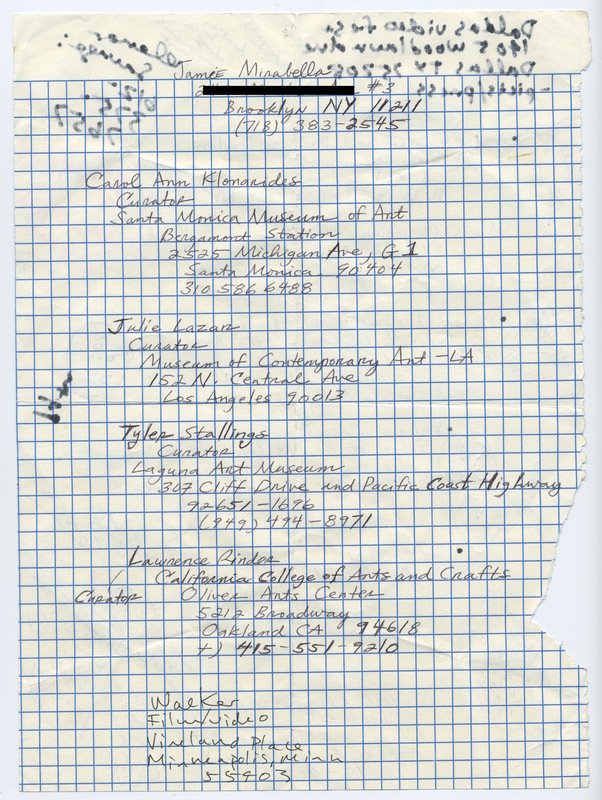 Big Miss Moviola college tour booking letter. 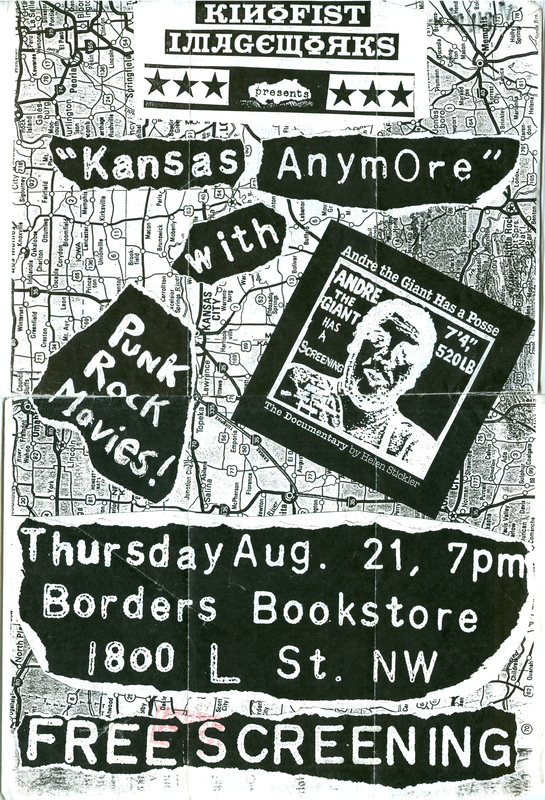 Color Xerox flier, 1996. 8.5″ x 11″. Written and designed by Miranda July and Julia Bryan-Wilson. 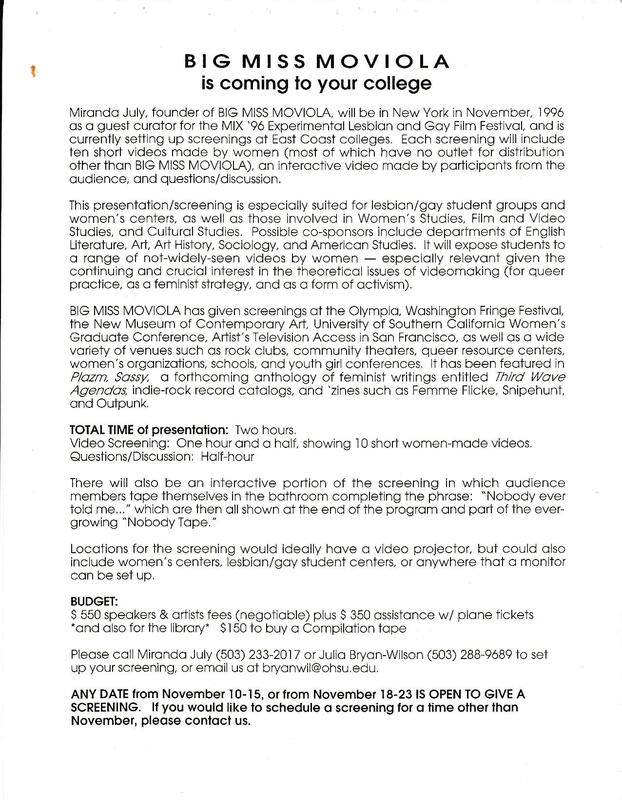 Note that the email address listed to arrange a booking of a Big Miss Moviola screening was Bryan-Wilson’s address from her day job at Oregon Health Sciences University, where she had access to the internet. July didn’t own a computer at the time. 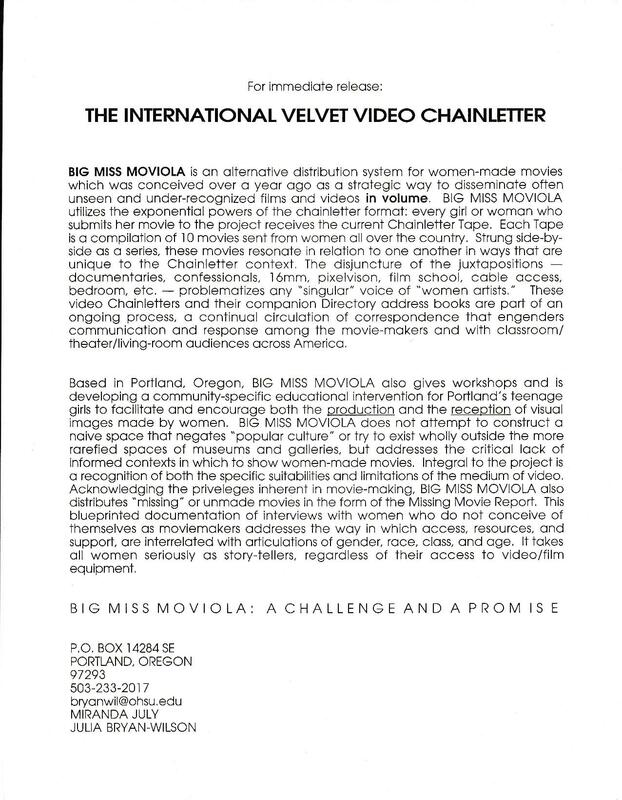 Big Miss Moviola press release. 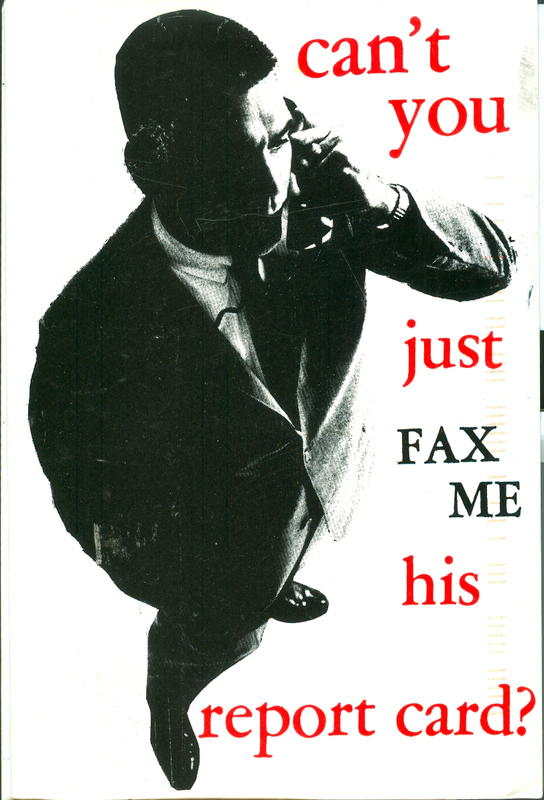 Color xerox flier, 1996. 8.5″ x 11″. Written and designed by Miranda July and Julia Bryan-Wilson. 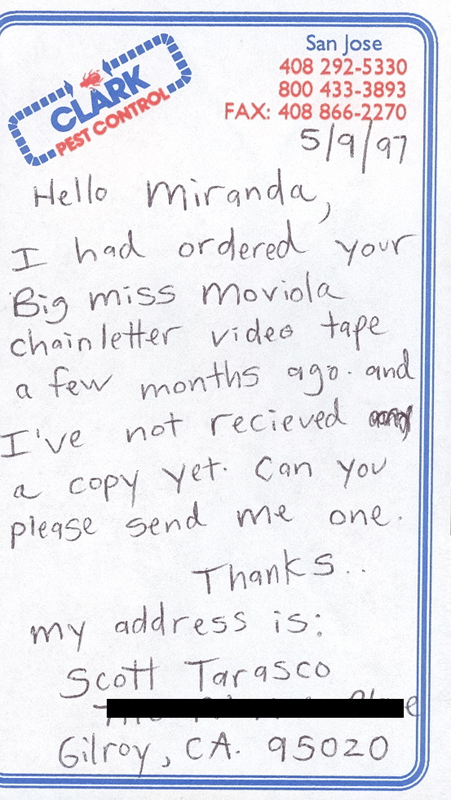 Note from Shannon Kring, filmmaker in The Underwater Chainletter, to Big Miss Moviola. July 11, 1996. 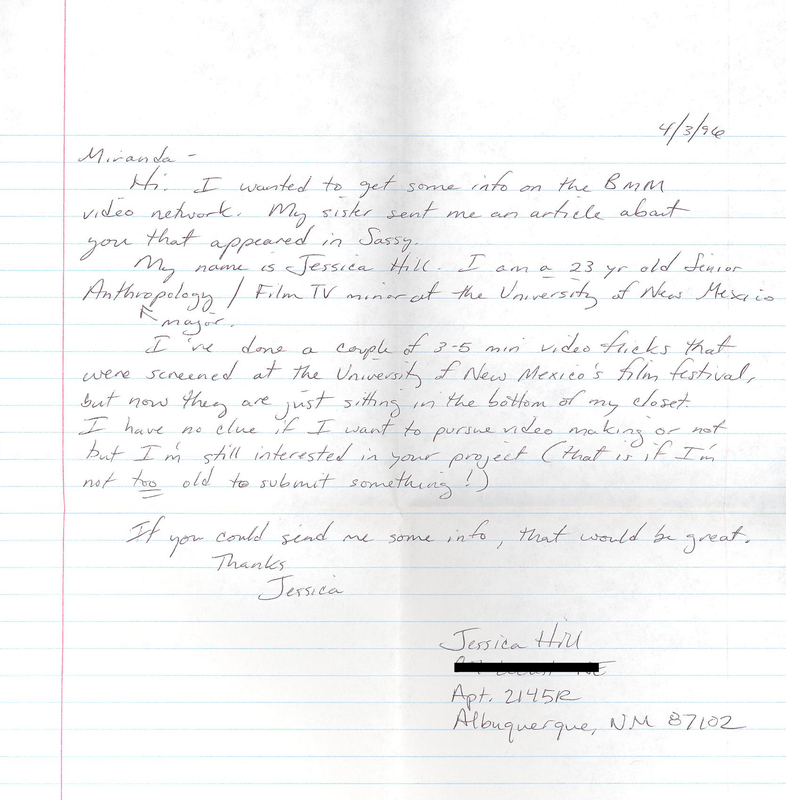 Letter from J. to Big Miss Moviola. July 20, 1996. 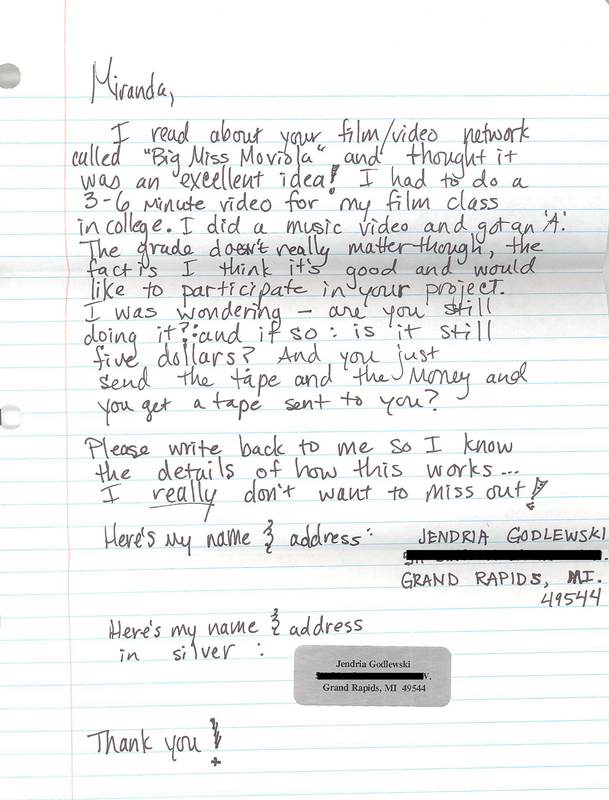 From Jendria Godlewski, filmmaker in The Underwater Chainletter, to Miranda July. c. 1996. 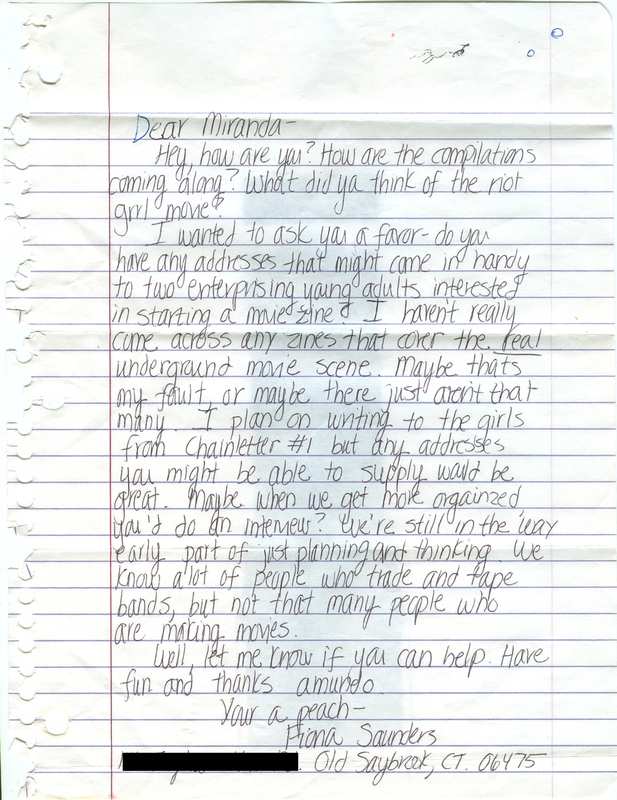 Letter from Nicole to Miranda. August 4, 1996. Letter from Megan to Miranda. August 15, 1996. 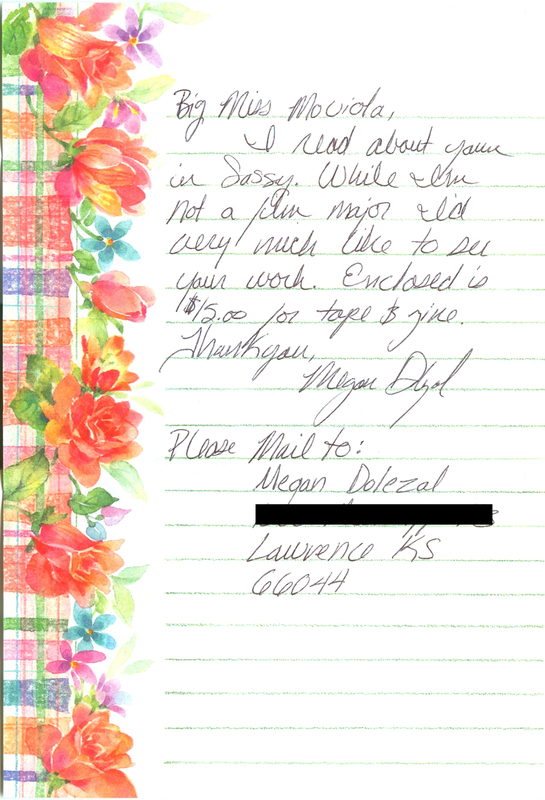 Letter from Megan to Big Miss Moviola. c. 1996. 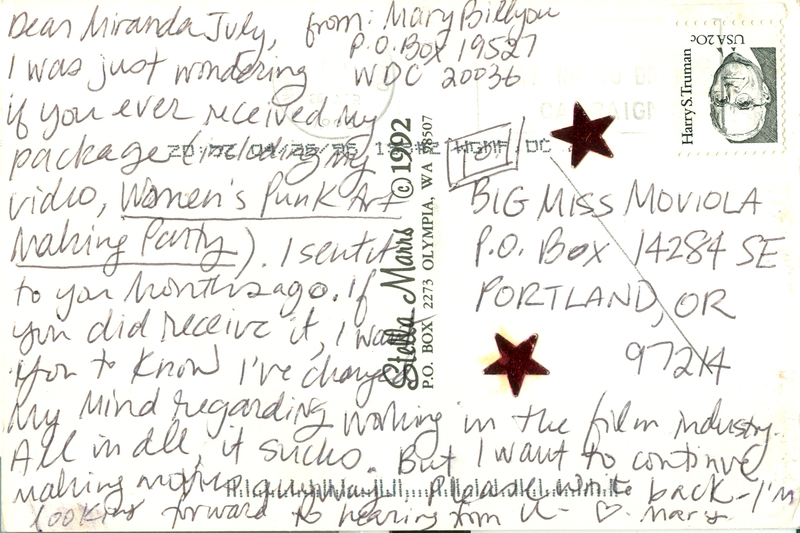 Postcard from Mary Billyou, filmmaker in The Velvet Chainletter, to Miranda. August 7, 1996. Letter from Beth to Miranda. October 27, 1996. Letter from J. to Miranda. January 14, 1997. 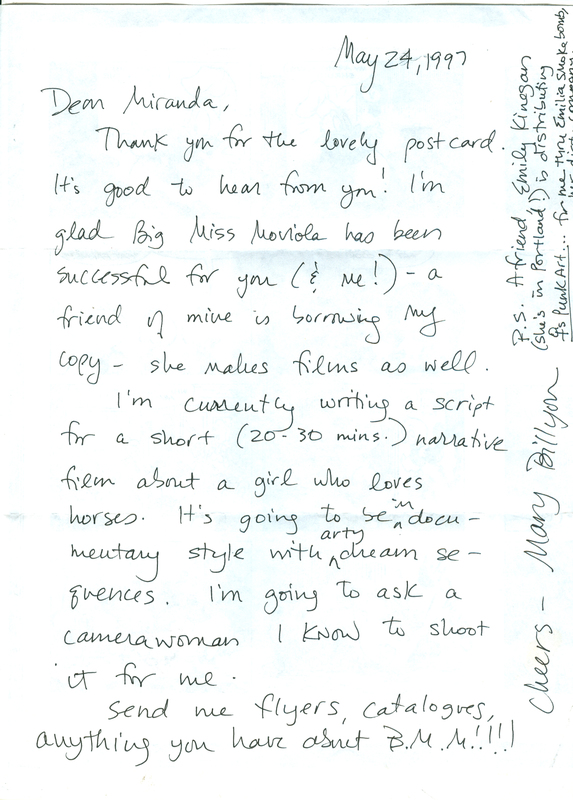 Letter from Hilary, Women In Film Program Manager, Tahoe International Film Festival, to Miranda. February 3, 1997. “The Missing Person Report,” c. 1995. Miranda July wore a snowman head to the opening of an exhibition curated by Julia Bryan-Wilson, “Dysappear,” where she passed out “The Missing Person Report”, a form on the back of which she later wrote her “business diary.” This was made around the same time as the Missing Movie Report (1996, http://joanie4jackie.com/archive/posters/#jp-carousel-8209) and the related text in the liner notes of July’s album, “10 Million Hours A Mile” (1997), about being a “missing person”. In this context missing means the opposite of straight — a person who leaves their family to start a new life under a new name. 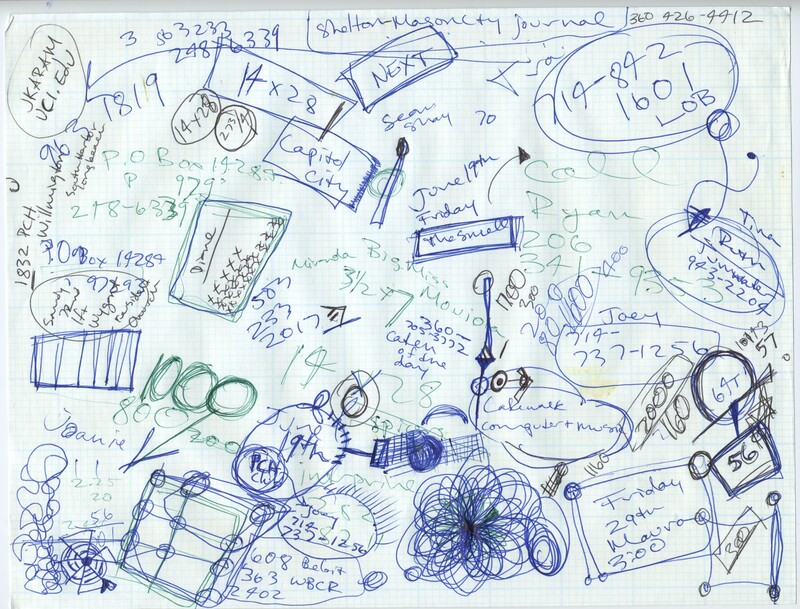 Page from Miranda July’s business diary. April 13, 1997. 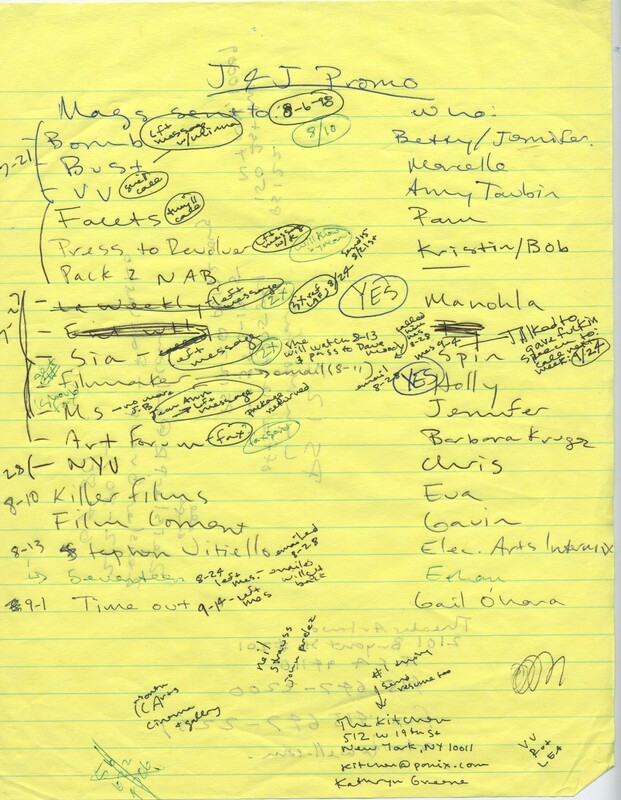 At the time this note was written July already had plans to create a Big Miss Moviola website. Here she makes a note about needing to visit the public library in order to check out what websites look like on the library’s public computers. 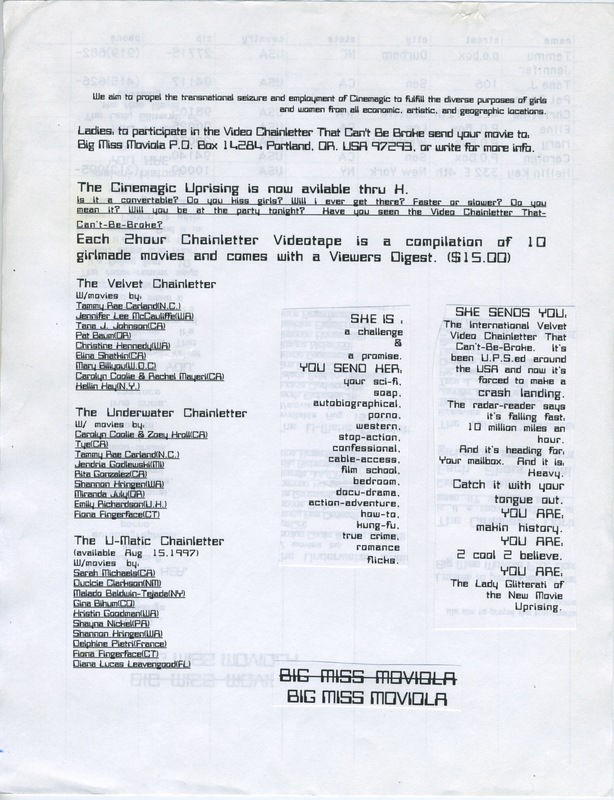 July also writes about researching video formats and ways to duplicate the chainletter tapes en masse. 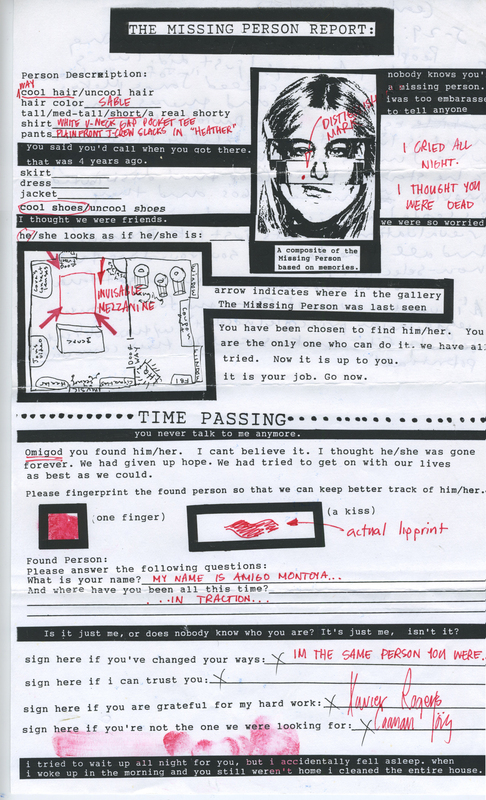 “The Missing Person Report” (c. 1995) was created by July for an exhibition curated by Julia Bryan-Wilson, “Dysappear.” July handed out this form to people in the gallery to fill out. 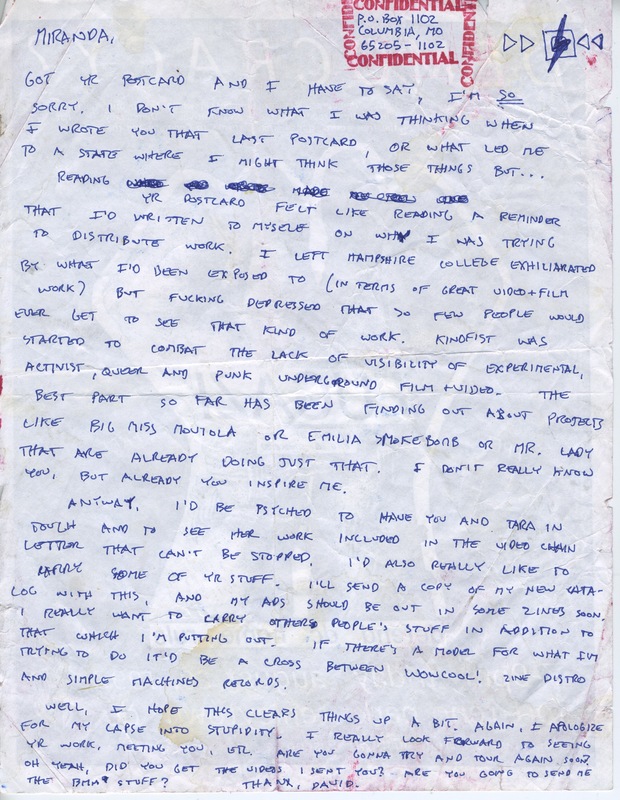 This was made around the same time as the Missing Movie Report (1996, http://joanie4jackie.com/archive/posters/#jp-carousel-8209) and the related text in the liner notes of July’s album, “10 Million Hours A Mile” (1997), about being a “missing person.” In this context missing means the opposite of straight — a person who leaves their family to start a new life under a new name. On the back of this is July’s business diary. 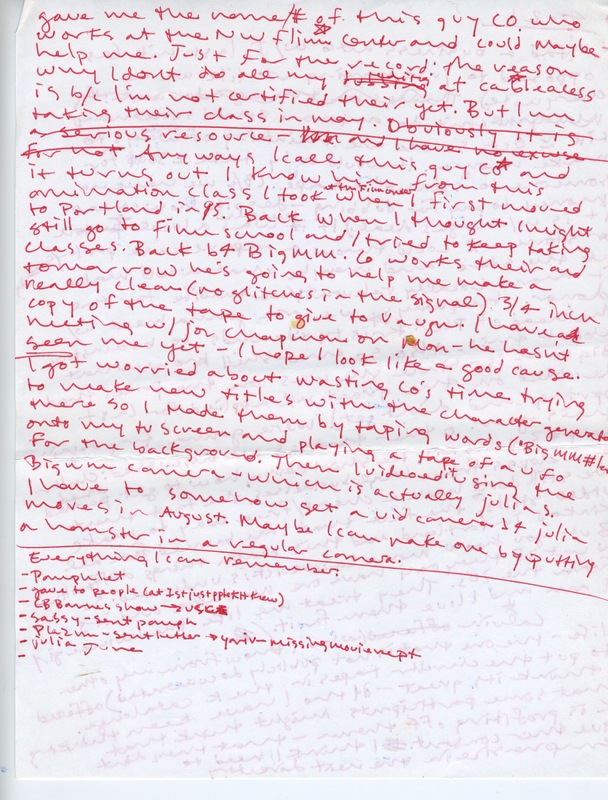 Page from Miranda July’s business diary. April 21, 1997. 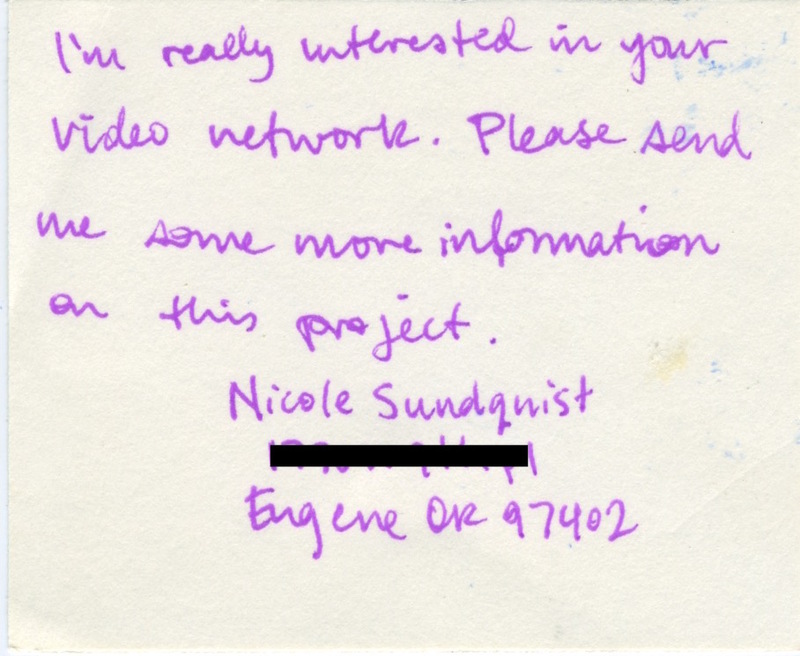 She discusses various potential resources, including a man named Co who was helping her edit the tapes together at the Northwest Film Center, and Jon Chapman at Vaugh Communications, a large-scale professional tape manufacturing company. Suit-wearing Chapman would become an unlikely ally, dubbing tapes for Joanie 4 Jackie for many years at a massive discount. Page from Miranda July’s business diary. April 21, 1997. 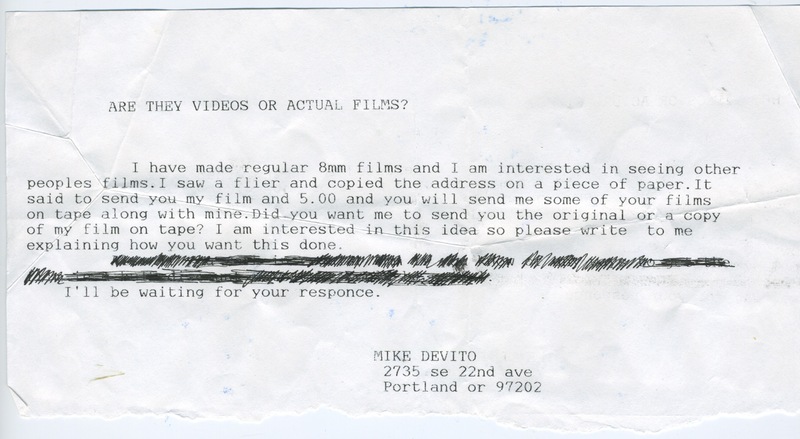 July writes about brainstorming with friend “J” (Julia Bryan-Wilson) on ways to make money to pay for Big Miss Moviola production costs and marketing, and how to make xerox copies now that July is “banned from all Kinko’s in Portland” (for stealing copies). 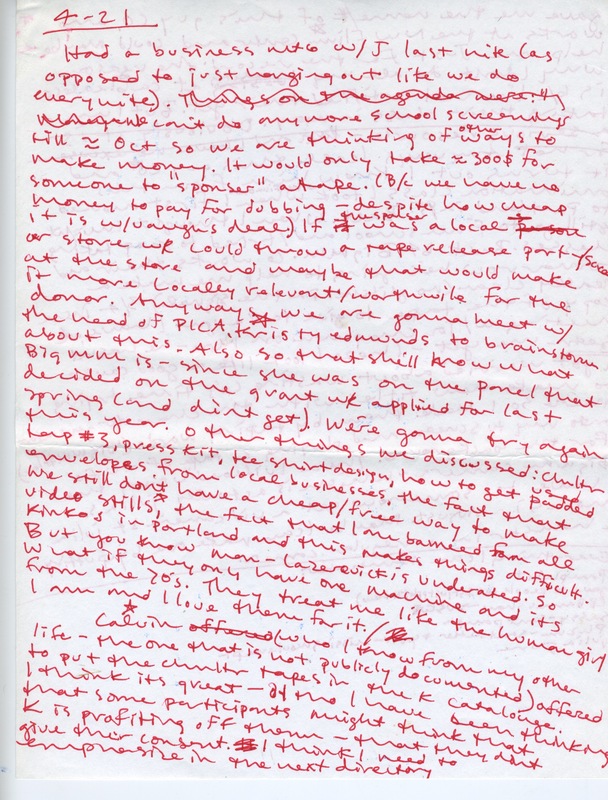 Page from Miranda July’s business diary. April 29, 1997. 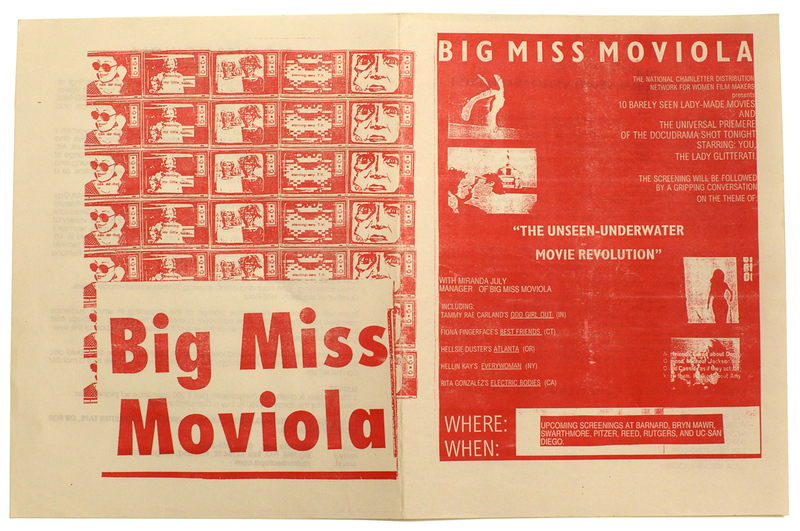 Xeroxed draft of Big Miss Moviola flier / catalog / order form. 1997. Designed by Miranda July. 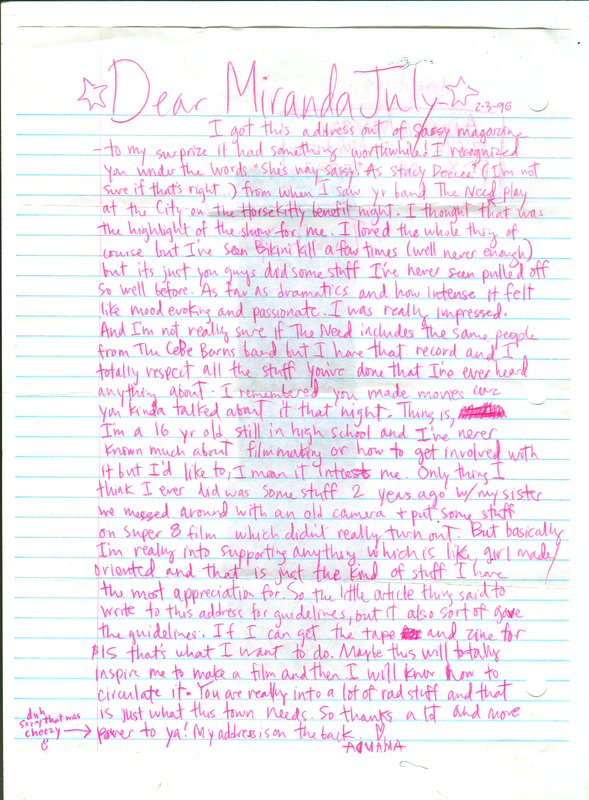 Letter from Scott to Miranda. May 9, 1997. 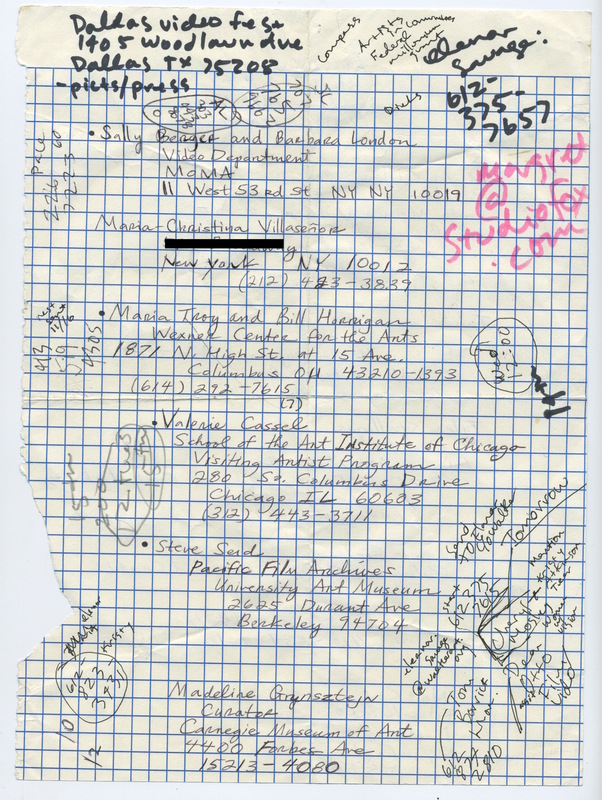 Miranda July’s handwritten notes on which newspapers, magazines, radio stations, and critics to contact regarding Joanie 4 Jackie. c. 1997. 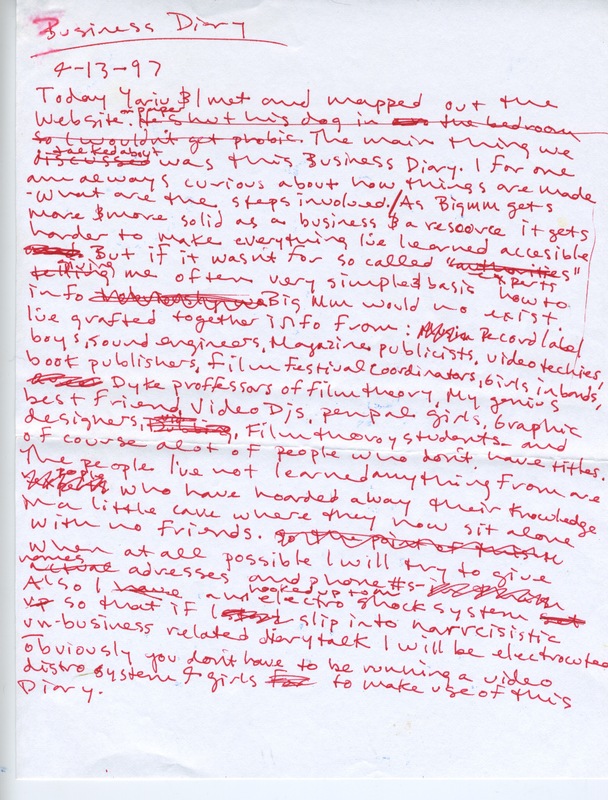 Miranda July’s handwritten notes on which programmers, organizers, venues, distributors, radio stations, critics, and artists to contact to plan an upcoming tour. c. 1997. 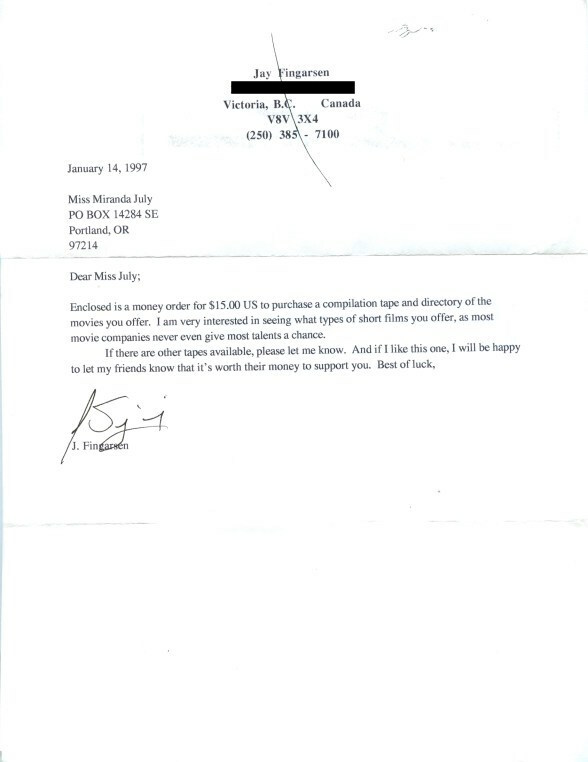 Letter from K.C. to Miranda. c. 1997. Letter from Rachel, Writer/Music Reviewer at Just Out, Oregon’s Lesbian and Gay Newsmagazine, to Miranda, about pitching a story to local arts weekly, Willamette Week. c. 1997. Letter from David to Miranda, front. 1997. 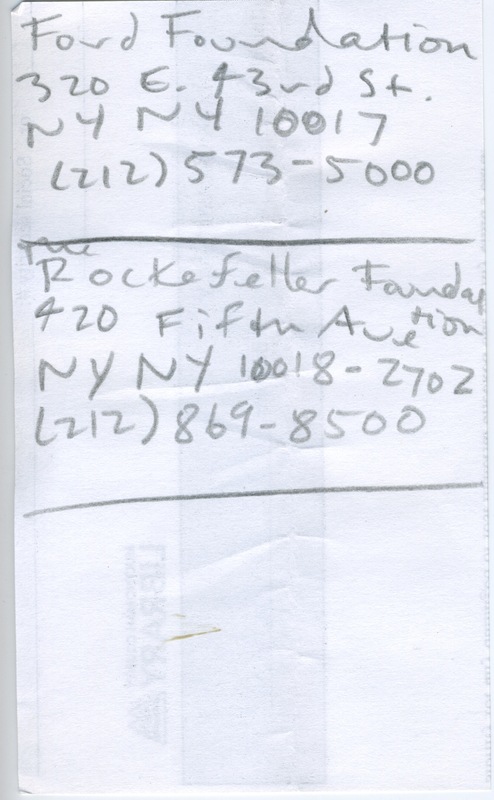 Flier on back of letter from David to Miranda. 1997. 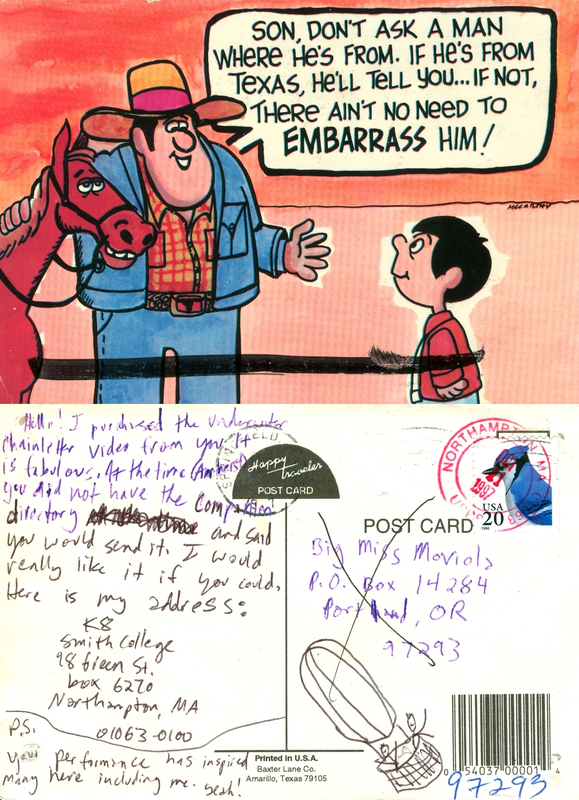 Postcard from Emily to Big Miss Moviola, back. May 18, 1997. 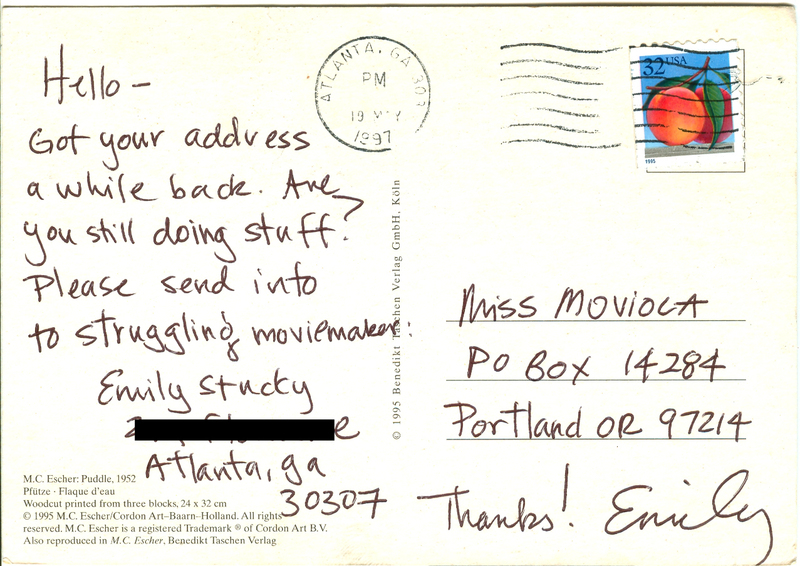 Postcard from Emily to Big Miss Moviola, front. May 18, 1997. 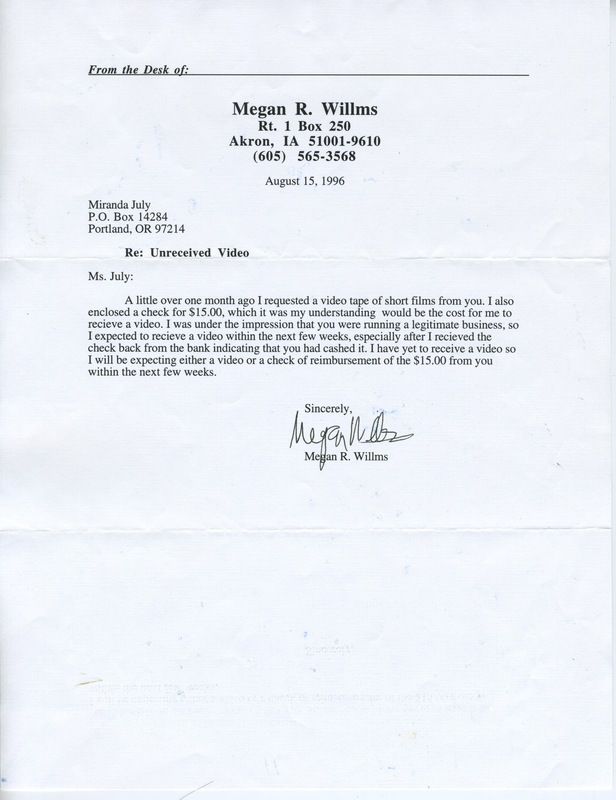 Letter from Mary Billyou, filmmaker in The Velvet Chainletter, to Miranda. May 24, 1997. Postcard from Mary to Miranda, back. August 15, 1997. 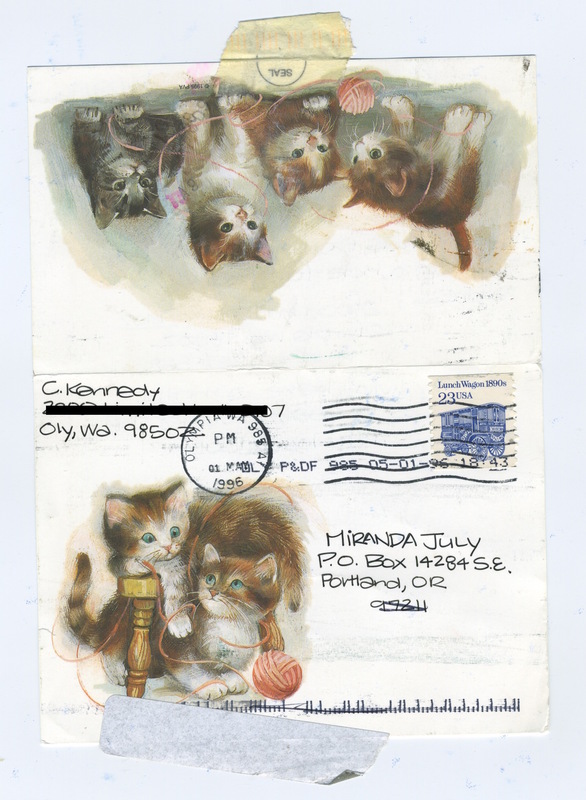 Postcard from Mary to Miranda, front. August 15, 1997. Letter from David to Miranda. c. September 1997. 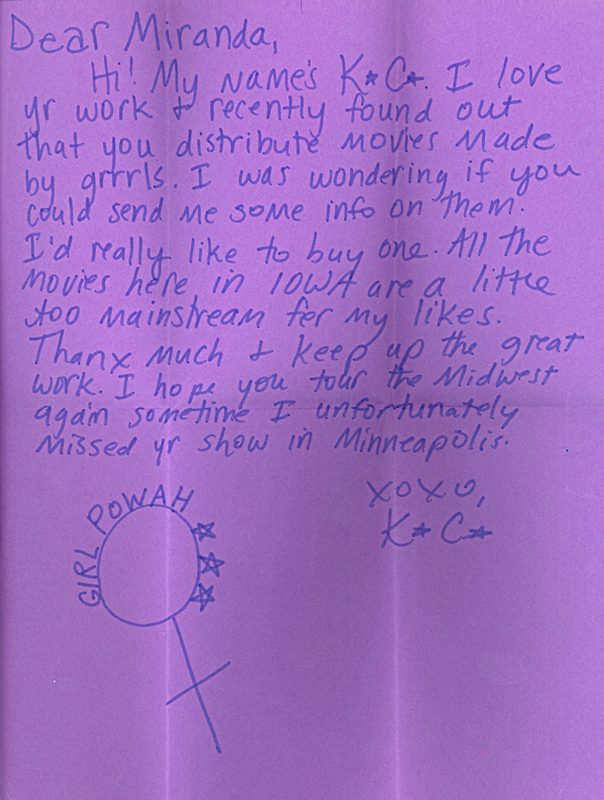 Postcard from K8 Hardy, filmmaker in The Cherry Cherry Chainletter, to Big Miss Moviola. October 11, 1997. 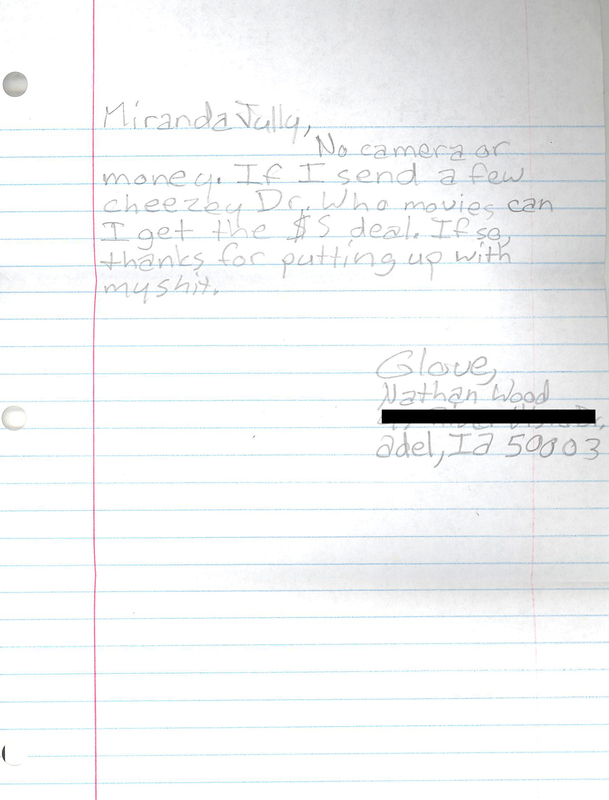 Letter from Nathan to Miranda. c. 1997. Letter from Brian to Miranda. c. 1997. Letter from Kristen to Miranda. December 5, 1997. Note from David to Big Miss Moviola. c. 1997. 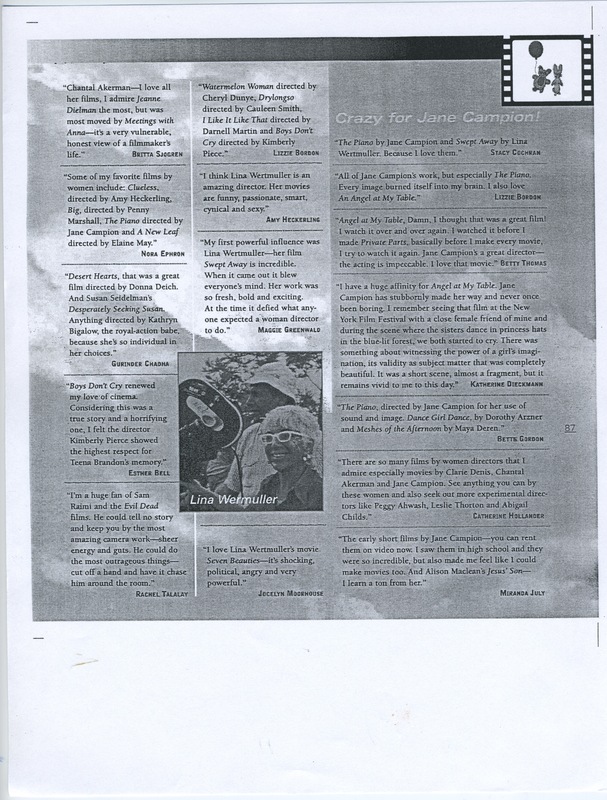 Letter from Fiona Saunders, filmmaker in Joanie 4 Jackie 4Ever, to Miranda. c. 1997. ICTV Tour Mailing List. c. 1997. 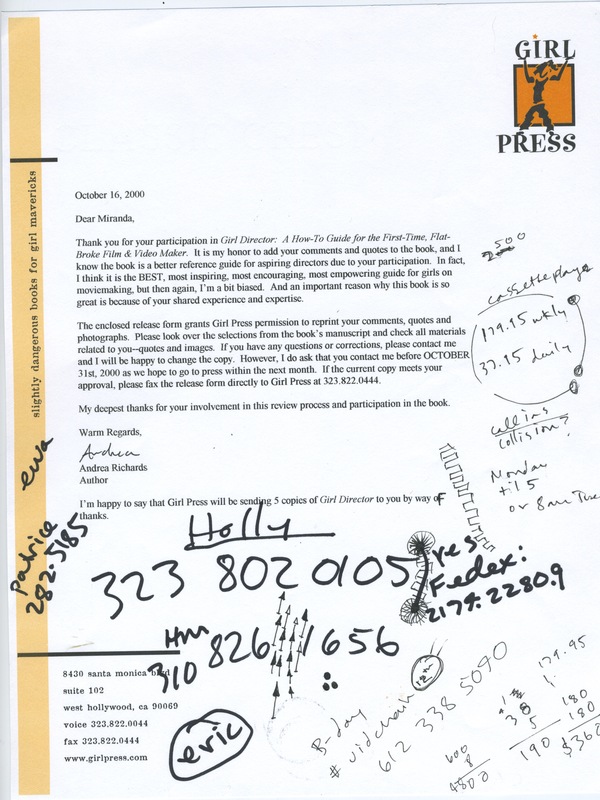 Letter to Big Miss Moviola. Page 1. Letter to Big Miss Moviola. Page 2. 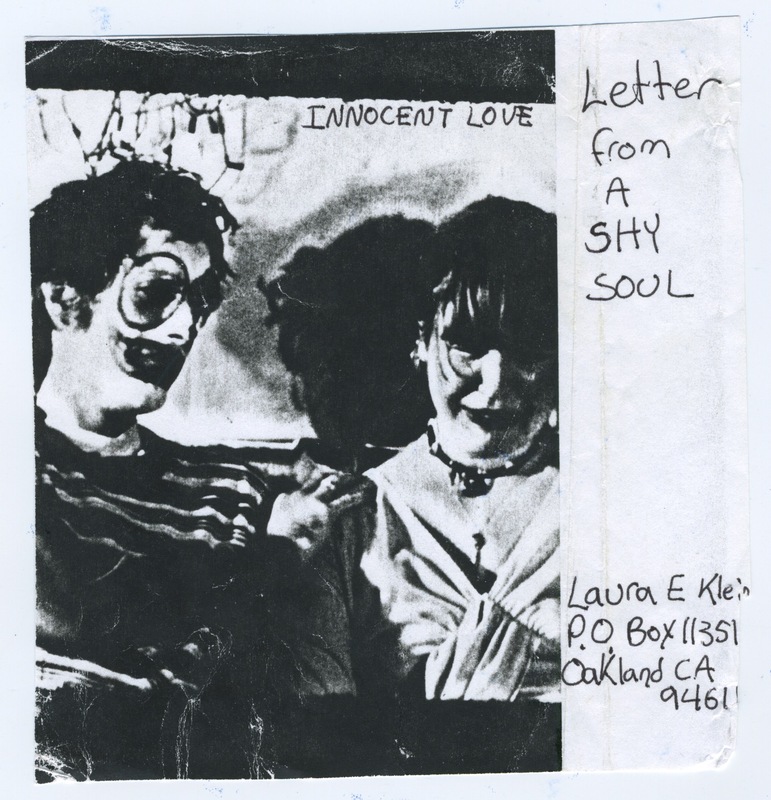 Letter from Laura Klein, filmmaker in The Break My Chainletter, to Miranda. c. 1999. 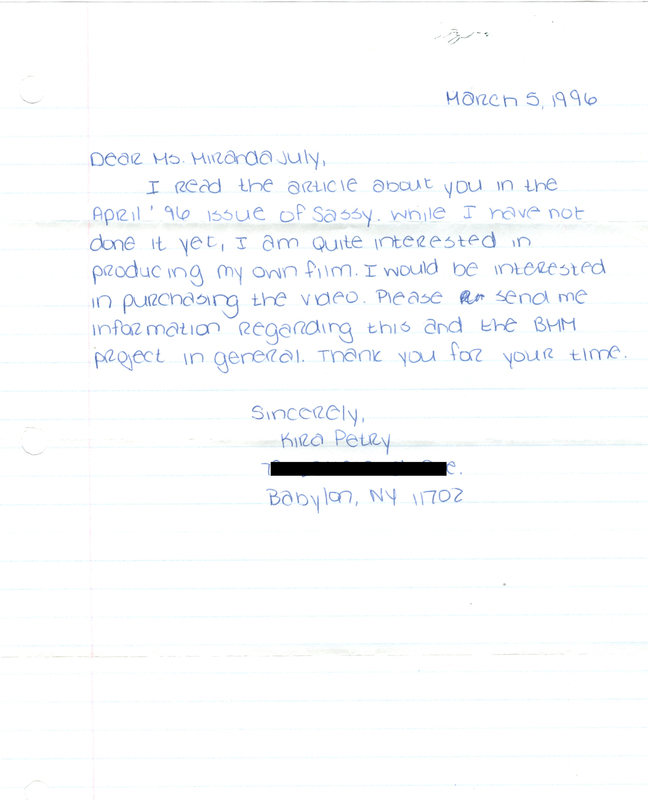 Letter from Mister Ed to Big Miss Moviola. Oct. 31. 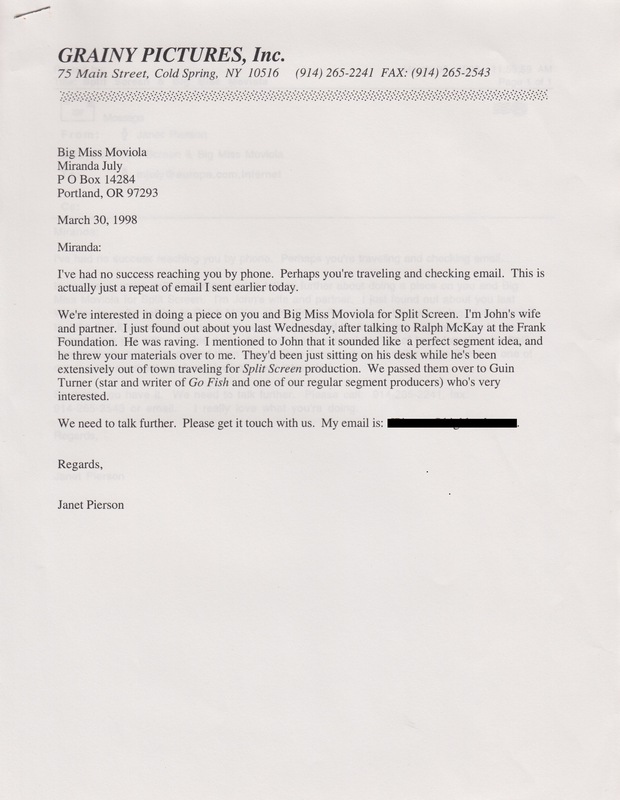 Letter from MS. J. to Big Miss Moviola. c. 1998. 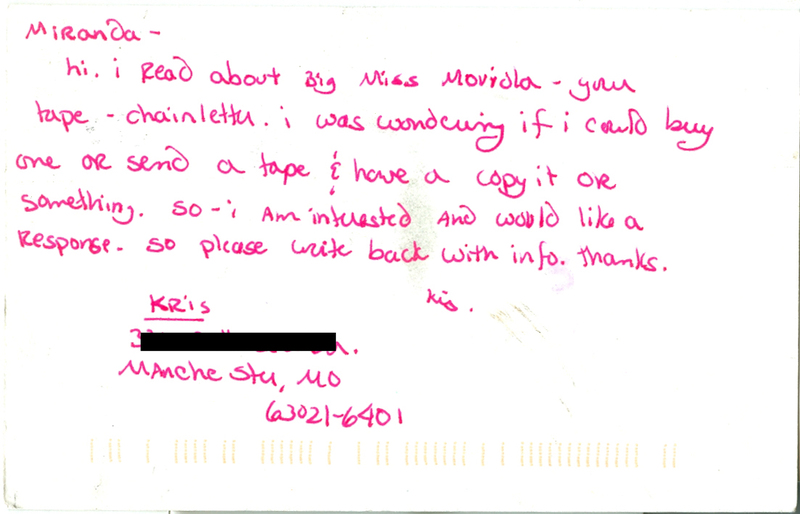 Letter from Katherine to Big Miss Moviola. January 11, 1998. 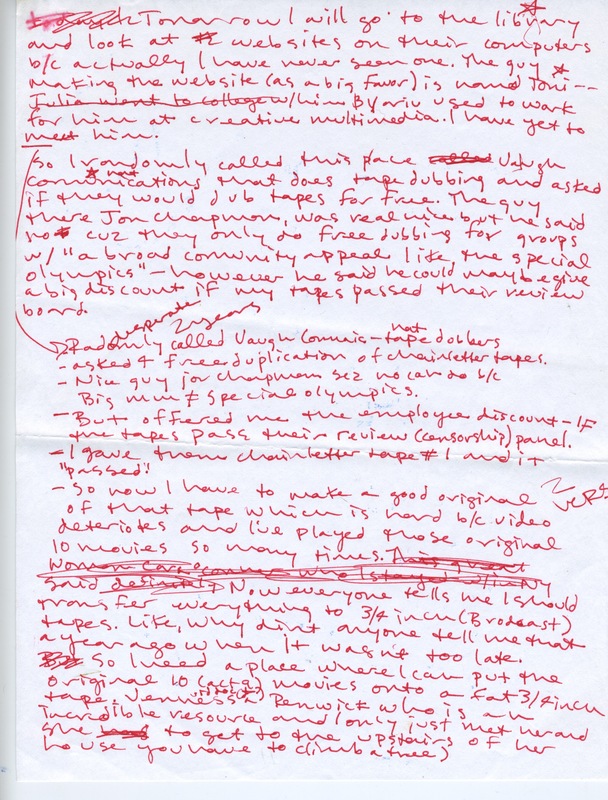 Miranda July’s handwritten notes for newspapers, magazines, distributors, and critics to contact regarding Joanie 4 Jackie. c. 1998. Includes publications focused on arts, film, feminism, and women and girls. 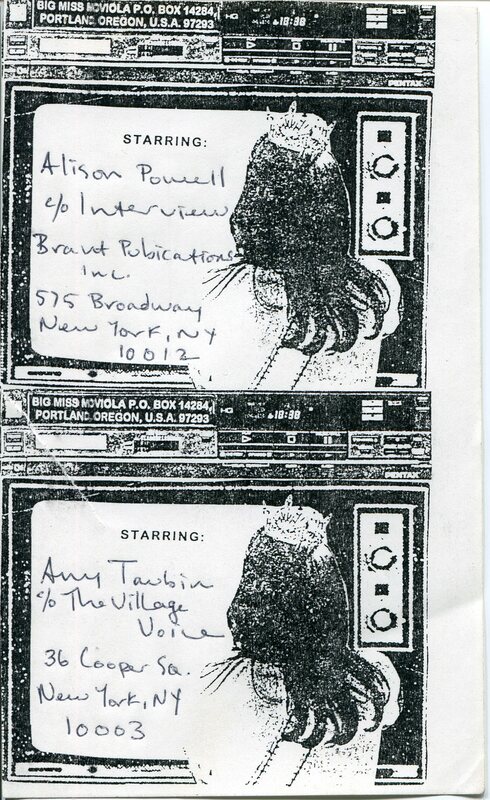 Big Miss Moviola “Starring” mailing labels addressed to Alison Powell at Interview Magazine and Amy Taubin at the Village Voice. Designed by Miranda July. c. 1998. 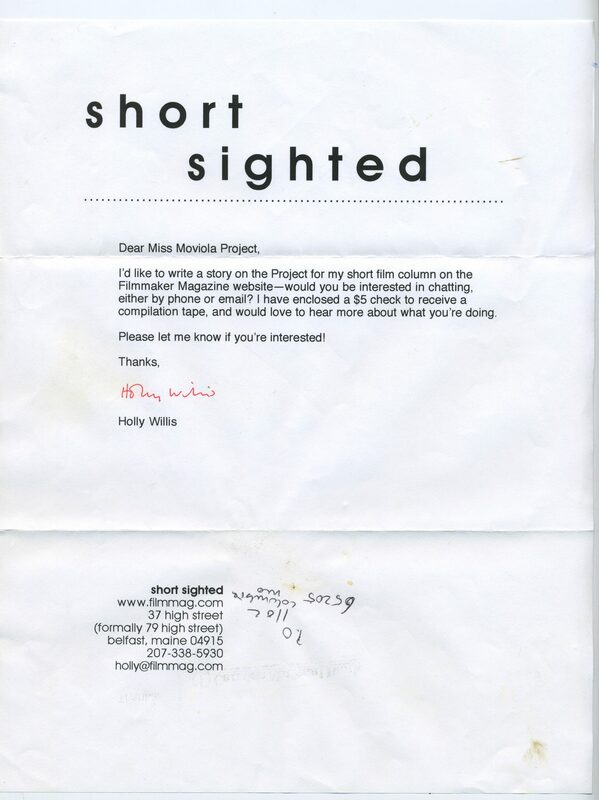 Letter from Holly Willis of Filmmaker Magazine to Big Miss Moviola. c. 1998. 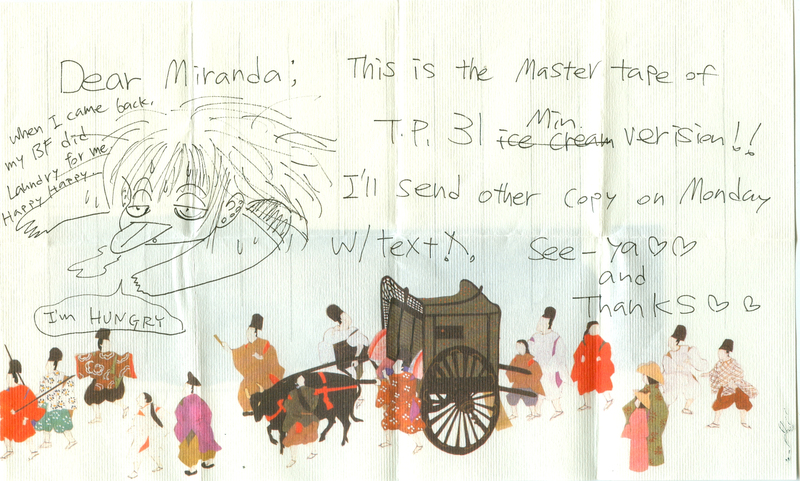 Letter from Miranda July to John Pierson, co-president of Grainy Pictures and host of Split Screen. February 26, 1998. 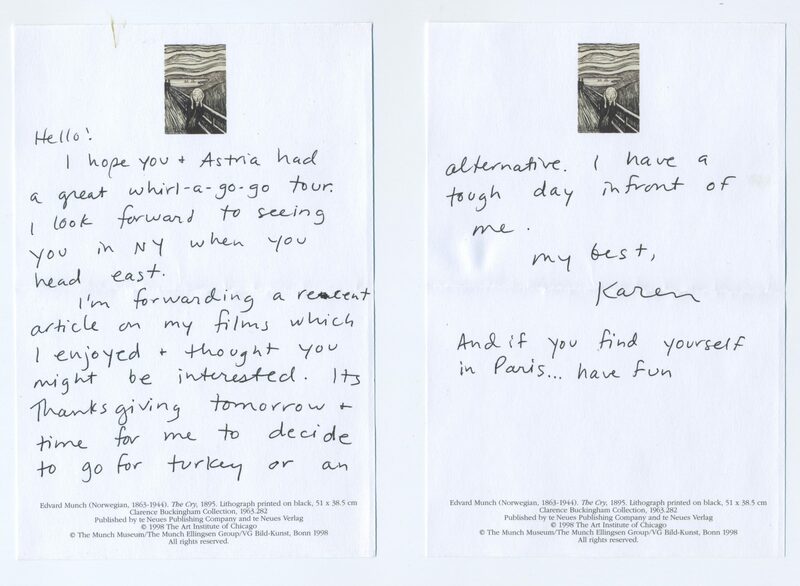 Letter from Janet Pierson, co-president of Grainy Pictures and producer of Split Screen, to Miranda July. March 30, 1998. 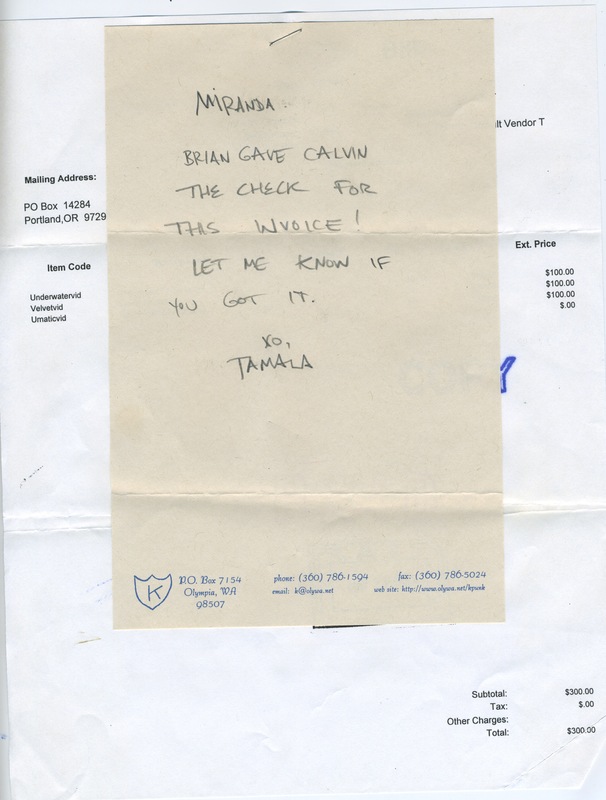 Letter from Tamala in response to Miranda July’s invoice for Joanie 4 Jackie tapes, which were distributed by K Records. May 1998. 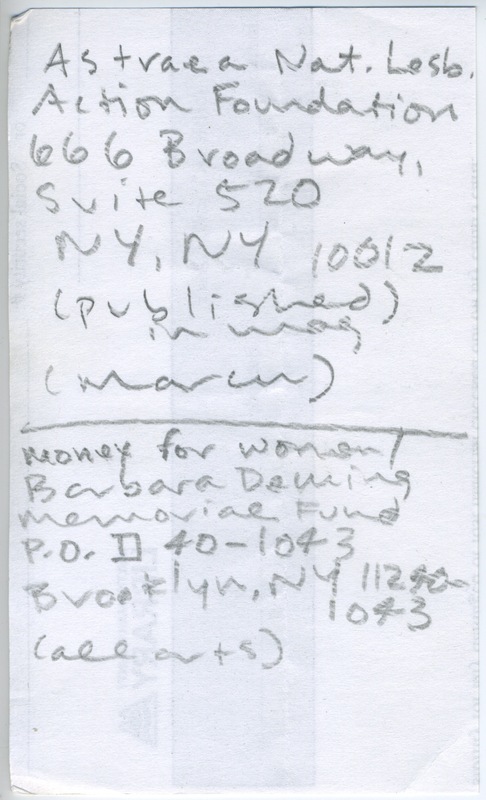 Paid bill from Miranda July to K Records for distribution of Joanie 4 Jackie tapes. May 22, 1998. 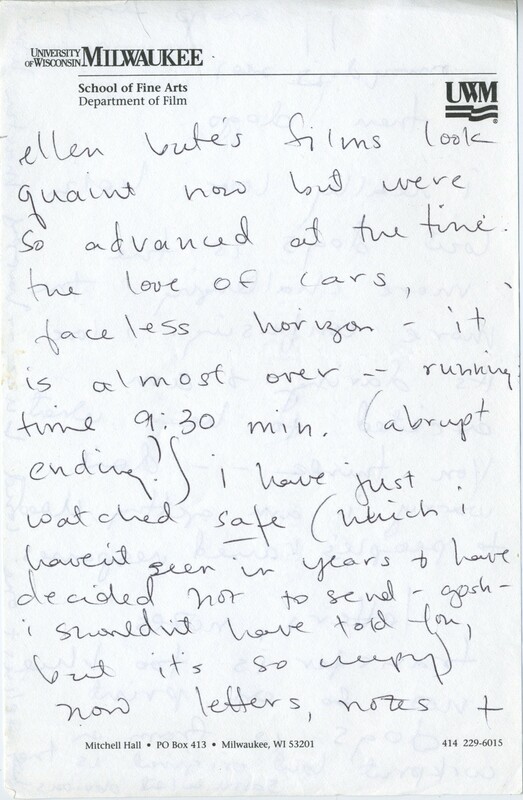 Letter from Yoriko Washiyama, filmmaker in Joanie 4 Jackie 4Ever, to Miranda, front. July 16, 1998. 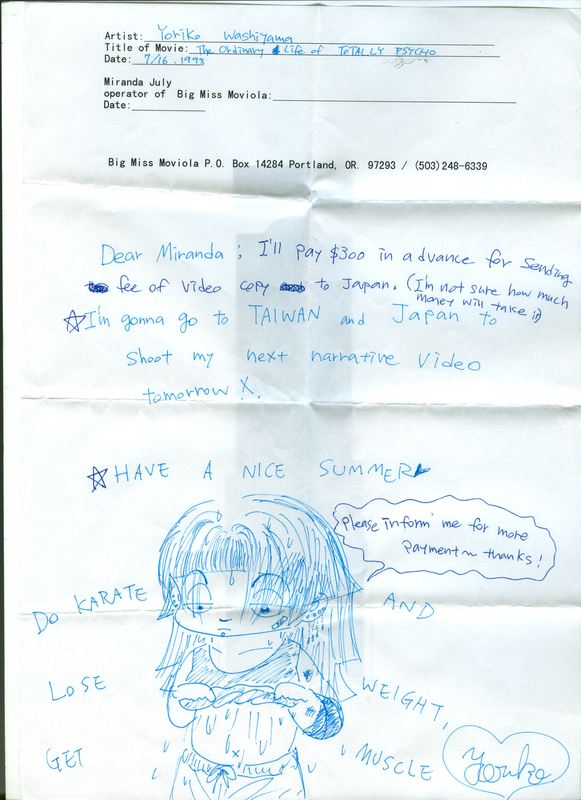 Letter from Yoriko Washiyama, filmmaker in Joanie 4 Jackie 4Ever, to Miranda, back. July 16, 1998. 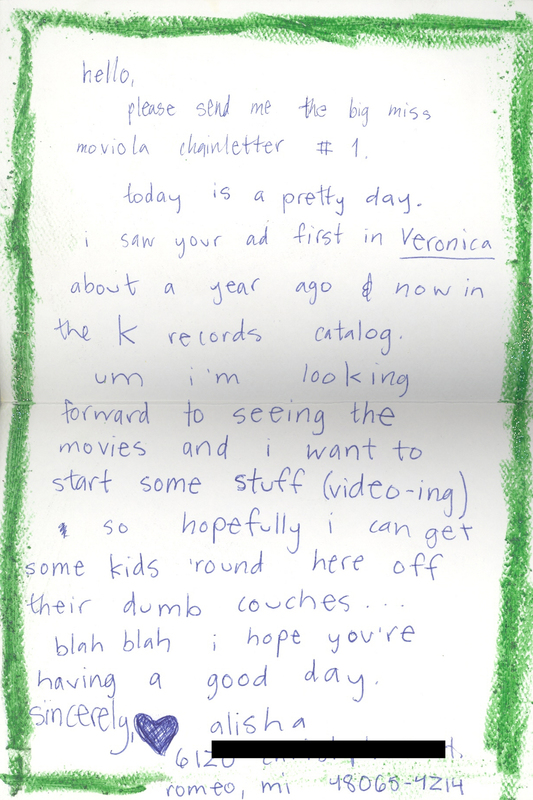 Postcard from Kris to Miranda. c. 1998. 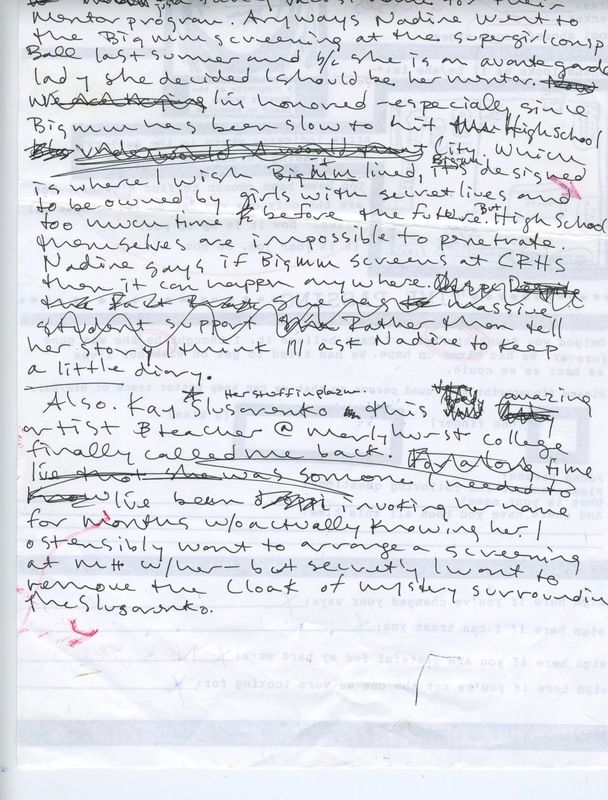 Handwritten notes with Miranda’s additions of screening venue contacts. c. 1999. Page 1. 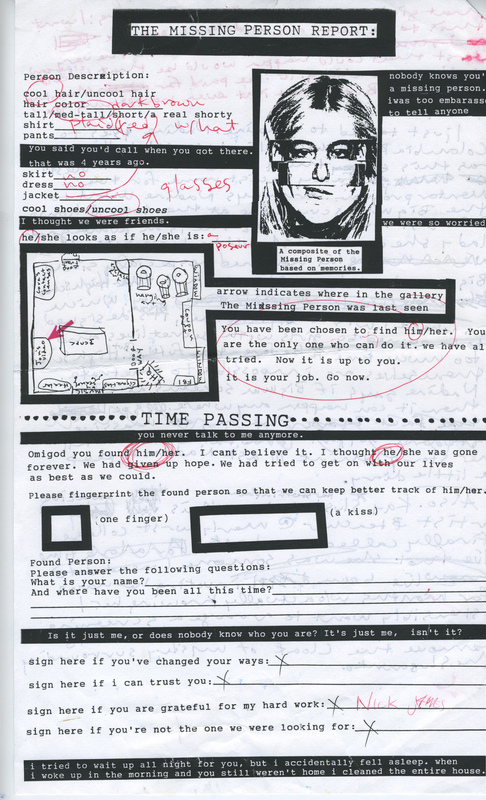 Handwritten notes with Miranda’s additions of screening venue contacts. c. 1999. Page 2. Notes from Astria Suparak researching videos for various programs (some listed at the bottom left: Pratt Institute Film Series, Gynomite, and Big Miss Moviola). 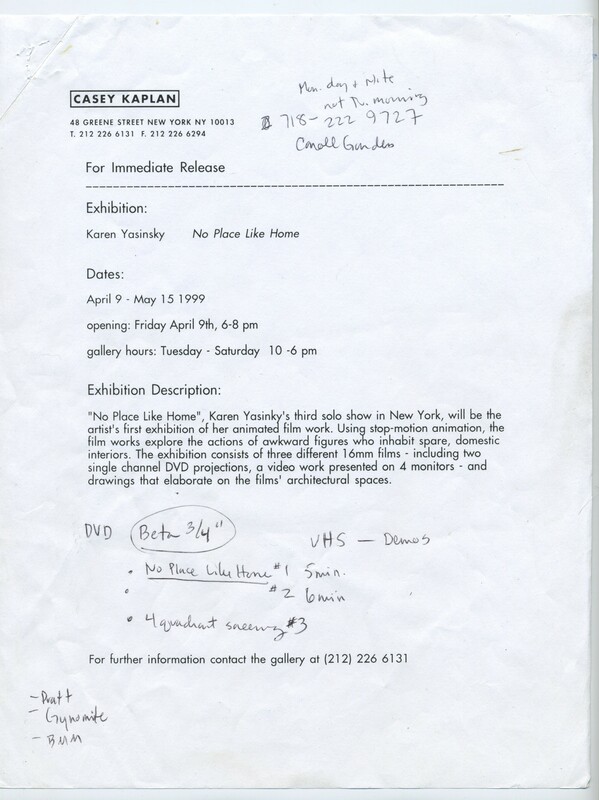 After seeing videos by Karen Yasinsky in a gallery in New York in 1999, Suparak arranged for a meeting with the artist in Brooklyn, NY (scheduling notes at the top right), looked at which video and format options were available (at bottom), and ended up including two videos of Yasinsky’s in the Some Kind of Loving Co-Star Tape #3 in 2000. From the collection of Astria Suparak. 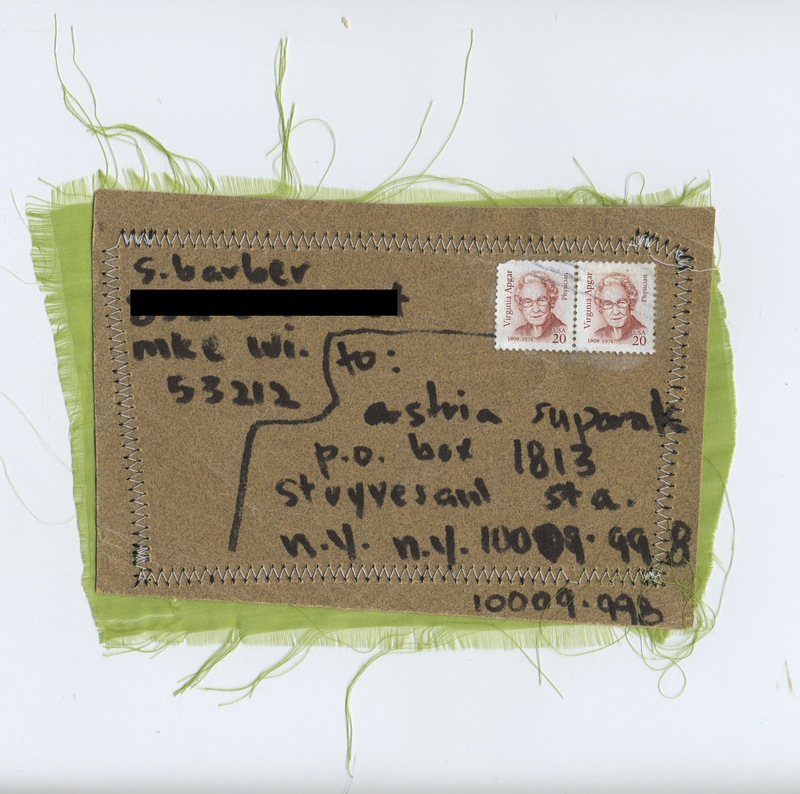 Front of envelope from Some Kind of Loving artist Stephanie Barber to curator Astria Suparak. Marker on sandpaper sewn to fabric. c. 1999. 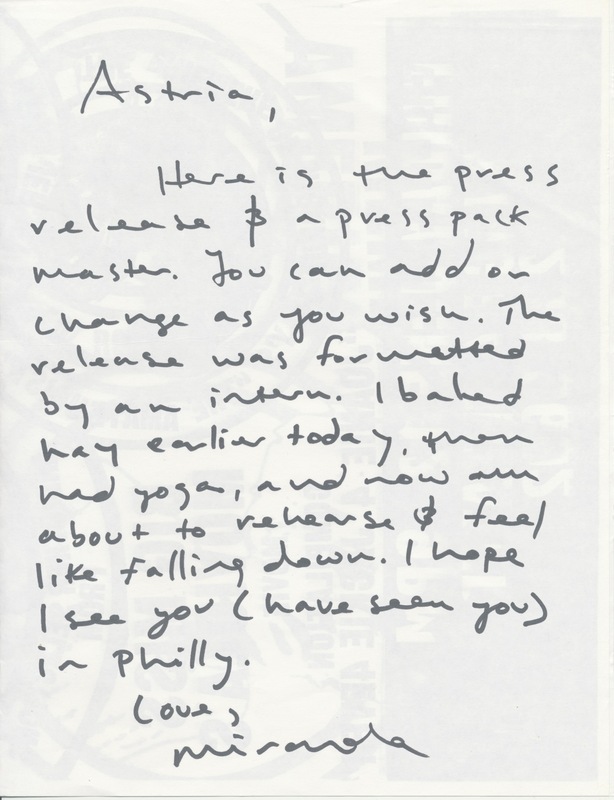 Letter from Stephanie Barber to Astria Suparak, about her films. At this time Suparak was researching film and videos for Co-Star Tape #3. Barber’s piece “pornfilm” was later selected for Some Kind of Loving. c. 1999. Page 1. From the collection of Astria Suparak. Letter from Stephanie Barber to Astria Suparak, about her recent films. At this time Suparak was researching film and videos for Co-Star Tape #3. Barber’s piece “pornfilm” was later selected for Some Kind of Loving. c. 1999. Page 2. From the collection of Astria Suparak. 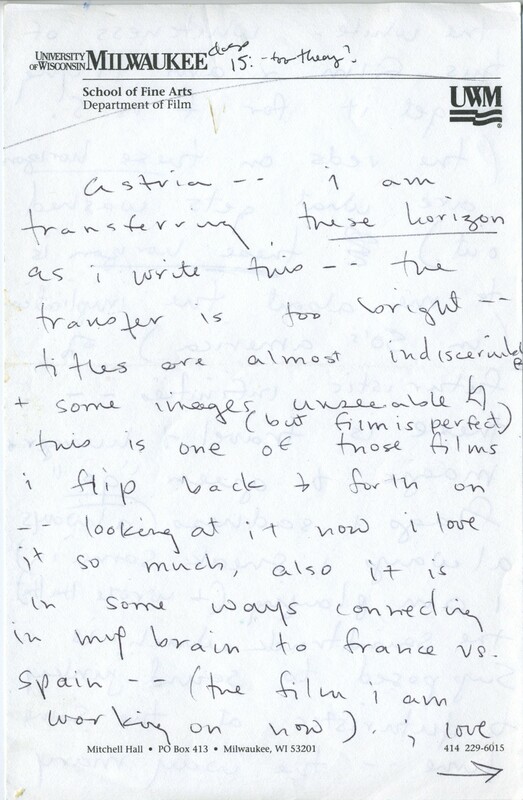 Letter from Stephanie Barber to Astria Suparak, which mentions Mary Ellen Bute’s films from the 1950s-60s. At this time Suparak was researching film and videos for Co-Star Tape #3. Barber’s piece “pornfilm” was later selected for the Some Kind of Loving compilation. c. 1999. Page 3. From the collection of Astria Suparak. 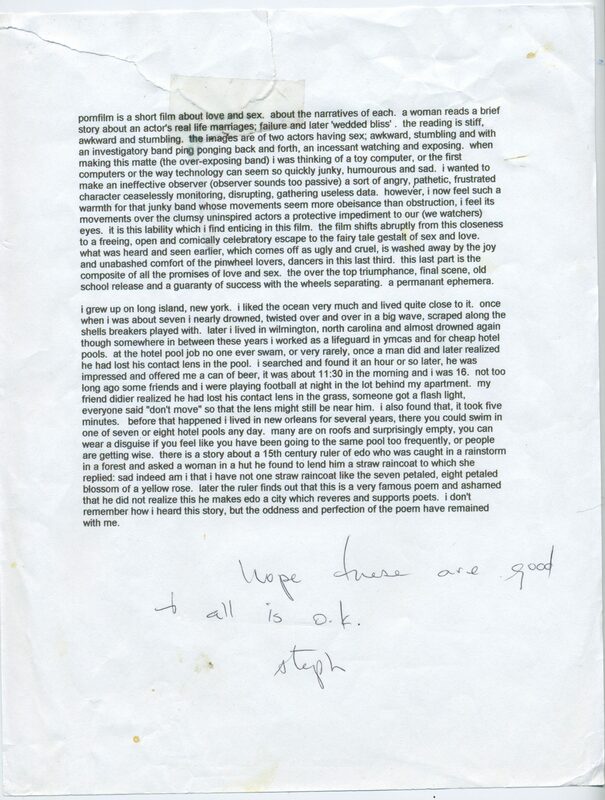 Letter from Stephanie Barber to Astria Suparak, talking about her recent films. At this time Suparak was researching film and videos for Co-Star Tape #3. Barber’s piece “pornfilm” was later selected for Some Kind of Loving. c. 1999. Page 4. From the collection of Astria Suparak. 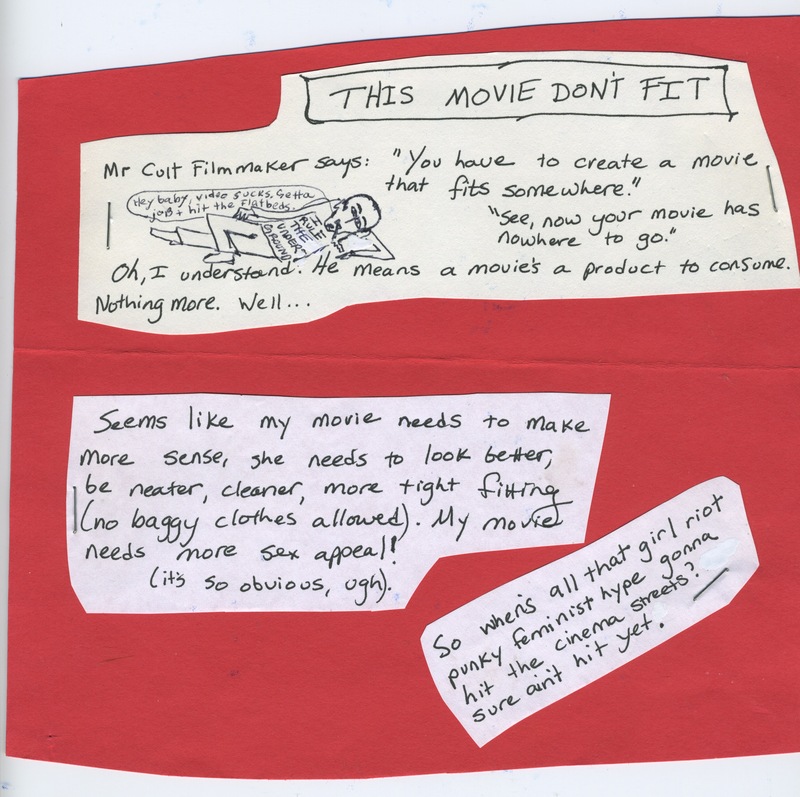 Letter from filmmaker Stephanie Barber to curator Astria Suparak, with draft text for the Some Kind of Loving Co-Star poster. c. 1999. From the collection of Astria Suparak. 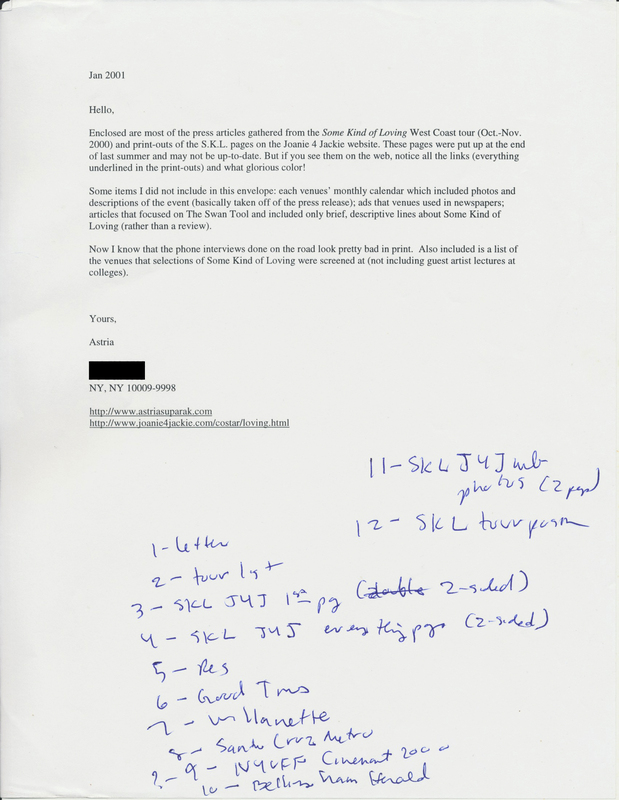 Letter from filmmaker Jane Gang to curator Astria Suparak, with handwritten notes by Gang regarding text drafts for the Some Kind of Loving Co-Star poster insert. Aug. 2000. Page 1. From the collection of Astria Suparak. 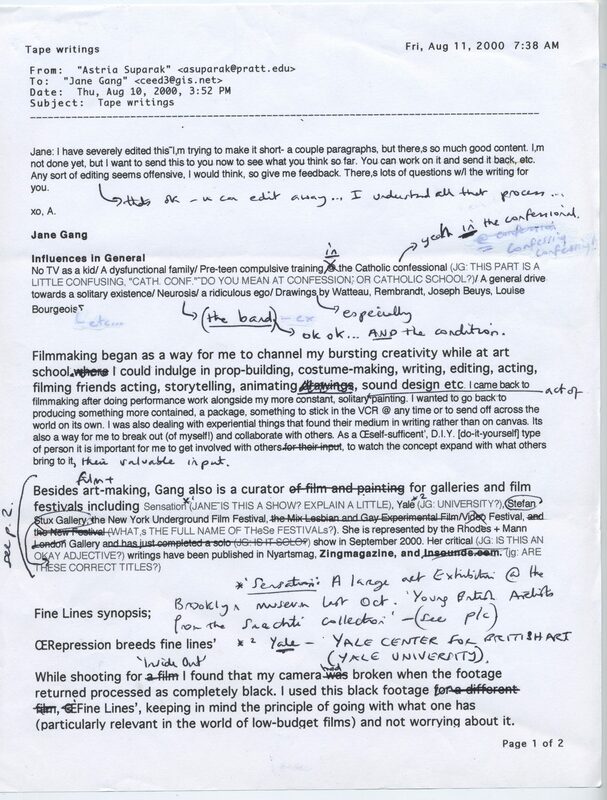 Letter from filmmaker Jane Gang to curator Astria Suparak, with handwritten notes by Gang regarding text drafts for the Some Kind of Loving Co-Star poster insert. Aug. 2000. Page 2. From the collection of Astria Suparak. 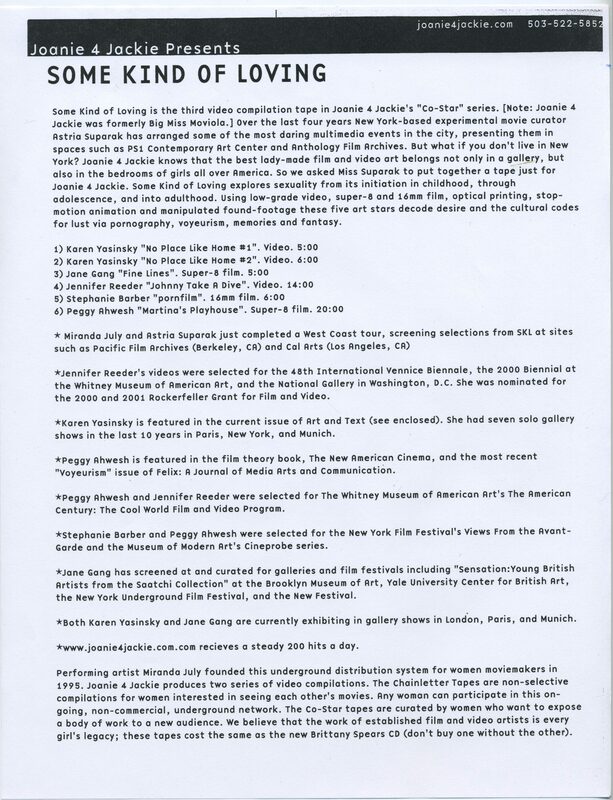 Press sheet for Co-Star Tape I Saw Bones, curated by Rita Gonzalez. 2000. 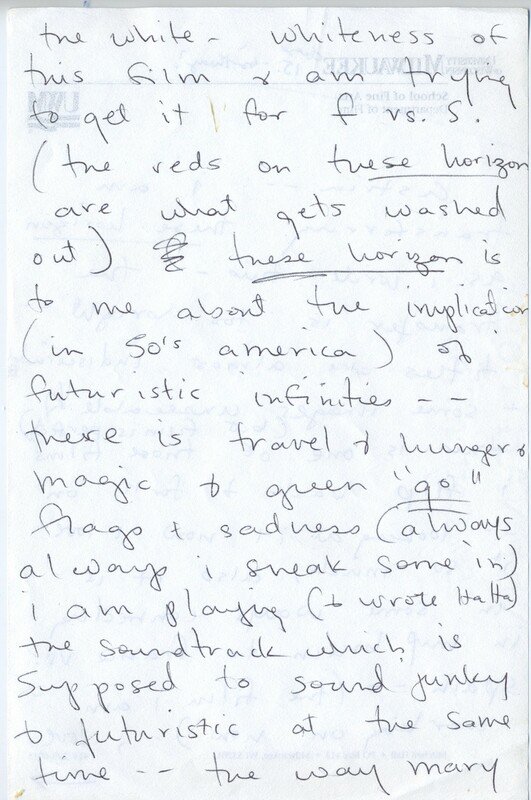 Notes Miranda July took while booking a Joanie 4 Jackie / Big Miss Moviola tour. c. 2000. Includes venue bookers, universities, newspapers, and radio stations. Letter from G.B. 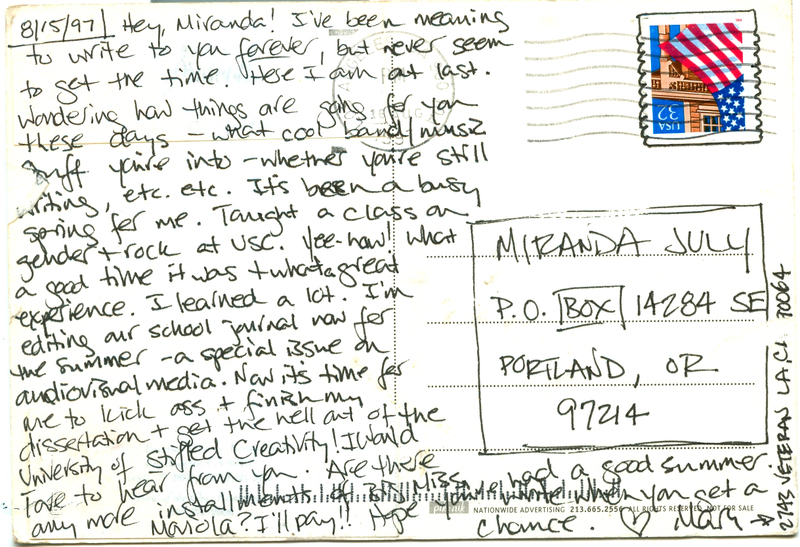 Jones, filmmaker in the U-Matic Chainletter, to Miranda. c. 2000. 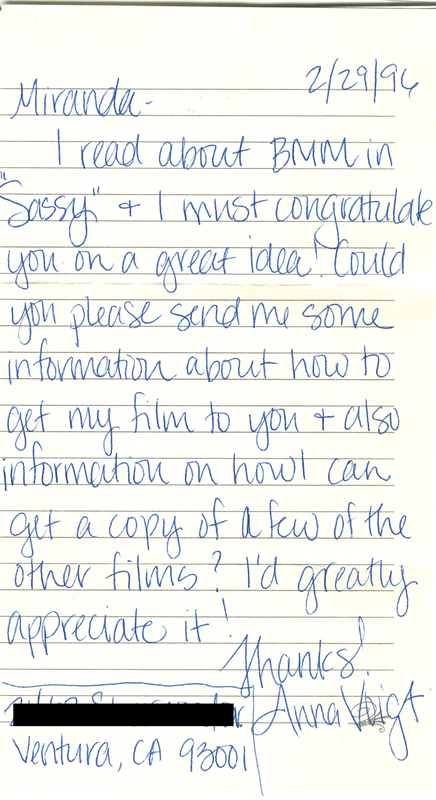 Letter from Andrea Richards, author of Girl Director: A How-To Guide for the First-Time, Flat-Broke Film & Video Maker, to Miranda. October 16, 2000. Book Proof for Girl Director: A How-To Guide for the First-Time, Flat-Broke Film & Video Maker, featuring Joanie 4 Jackie. October 16, 2000. Book Proof for Girl Director: A How-To Guide for the First-Time, Flat-Broke Film & Video Maker, with a quote by Miranda July on being inspired by Jane Campion and Alison Maclean. October 16, 2000. 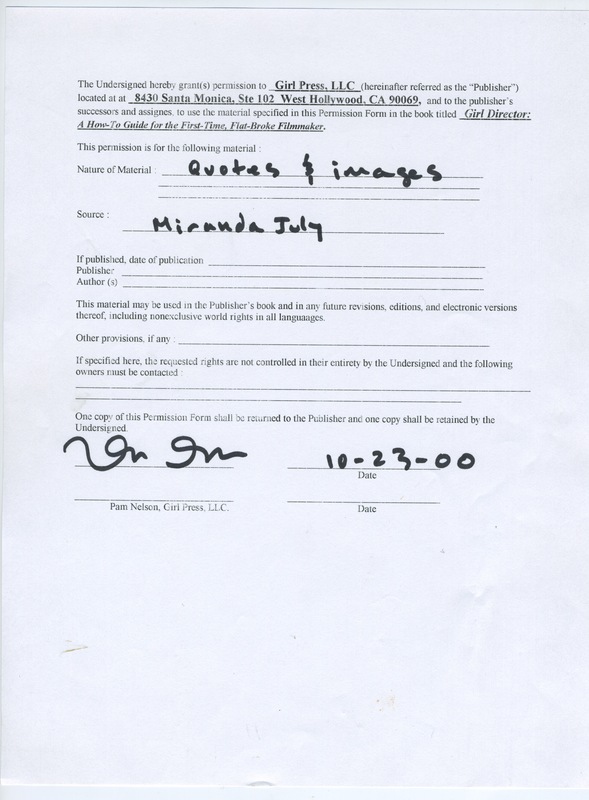 Permission Form for Girl Director: A How-To Guide for the First-Time, Flat-Broke Film & Video Maker, to use quotes and images from Miranda July regarding Joanie 4 Jackie. October 23, 2000. 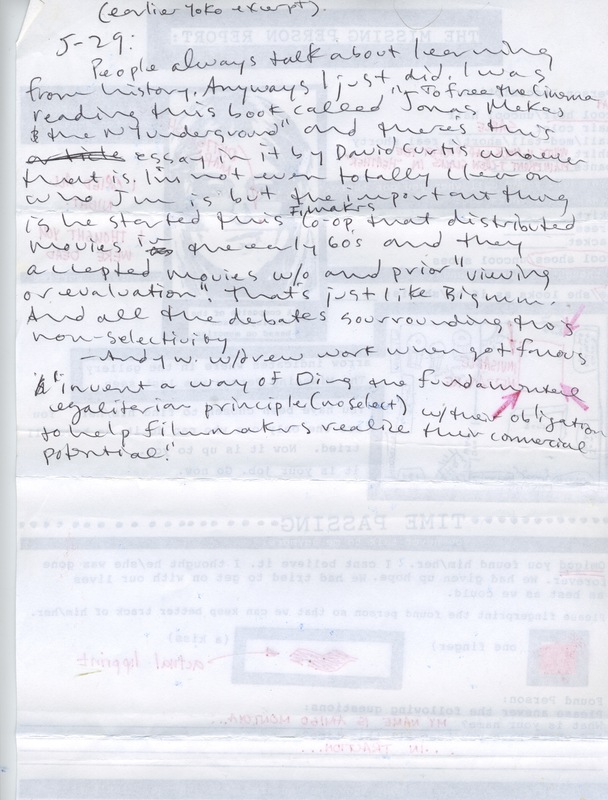 Letter from Miranda July to Astria Suparak. c. 2001. Written on the back of a show flyer for July and MeMe America. 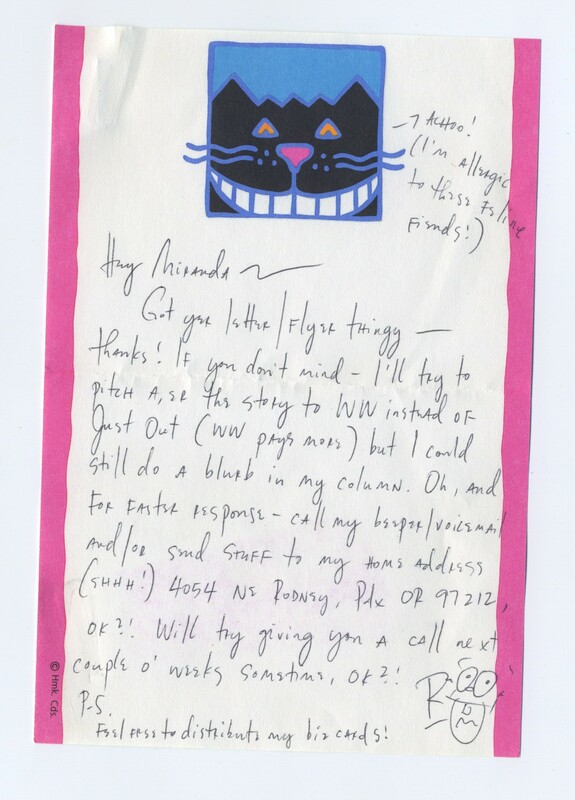 Postcard from Miranda July to Astria Suparak. c. 2001. At the time, Suparak was touring with curated programs of film, video and music, and selling her curated Co-Star tape, Some Kind of Loving, as part of her tour merchandise. 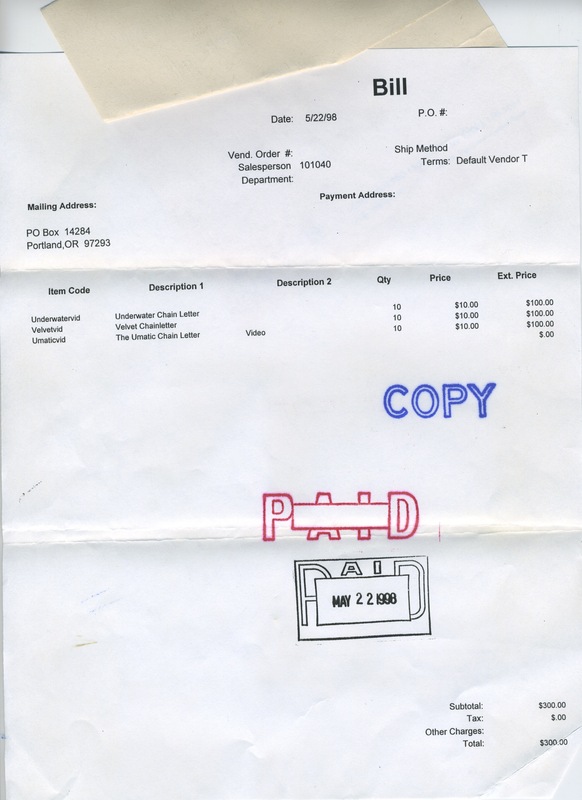 Here July explains how Suparak can purchase extra tapes at the same cost as the distributor, K Records, for $8 each. July also mentions a recent review of Some Kind of Loving in Bust Magazine and an upcoming screening of the tape in Mexico. 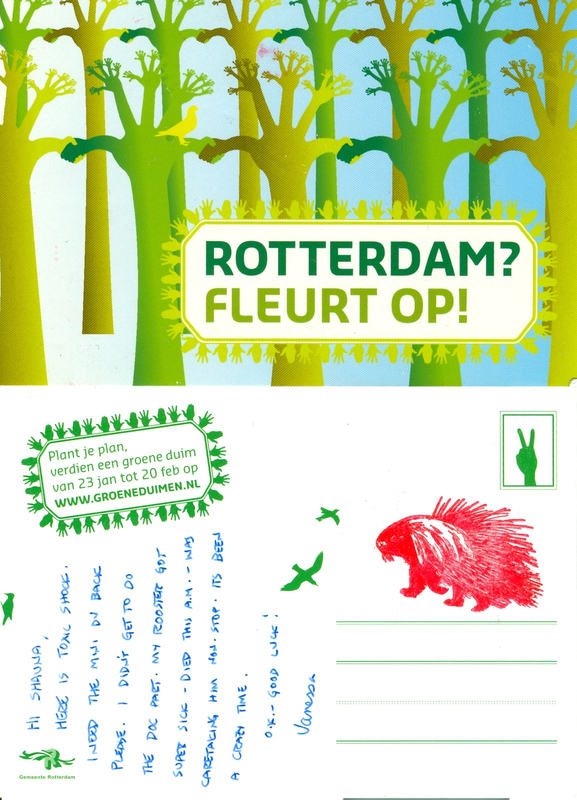 Postcard from Jane to Charlotte, front. c. 2001. 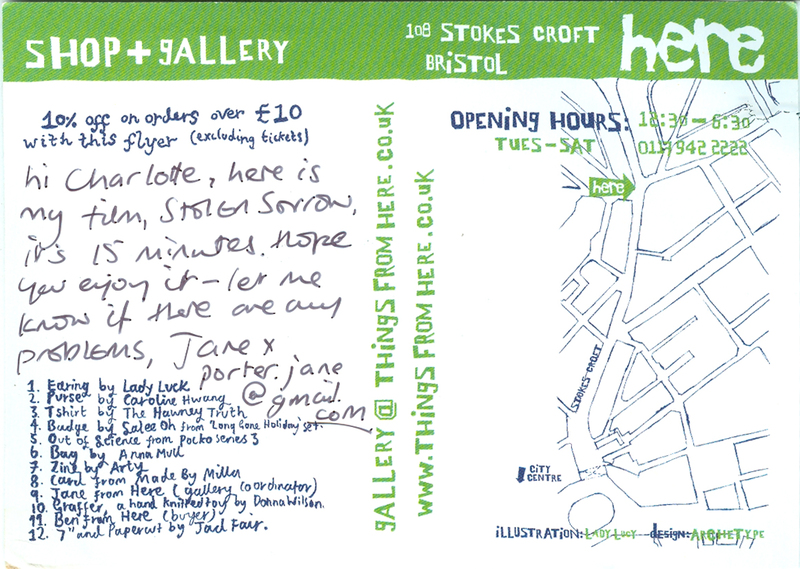 Postcard from Jane to Charlotte, back. c. 2001. 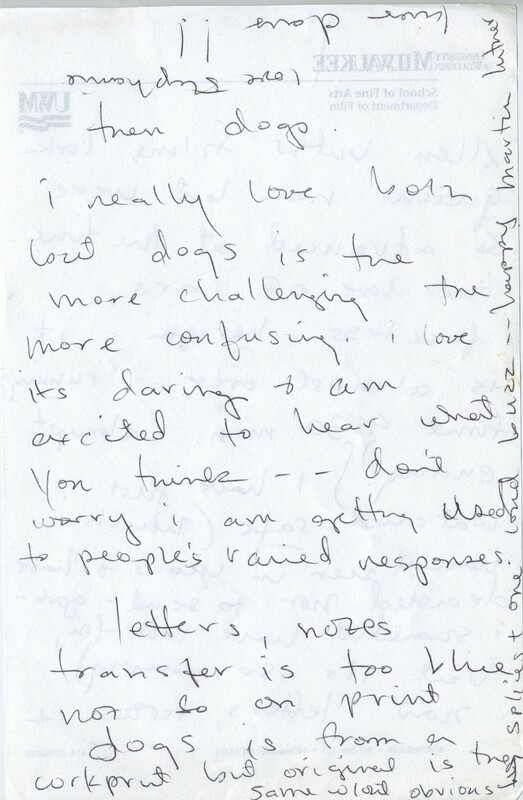 Note from Miranda July to Some Kind of Loving curator Astria Suparak, written on an envelope. 2001. From the collection of Astria Suparak. 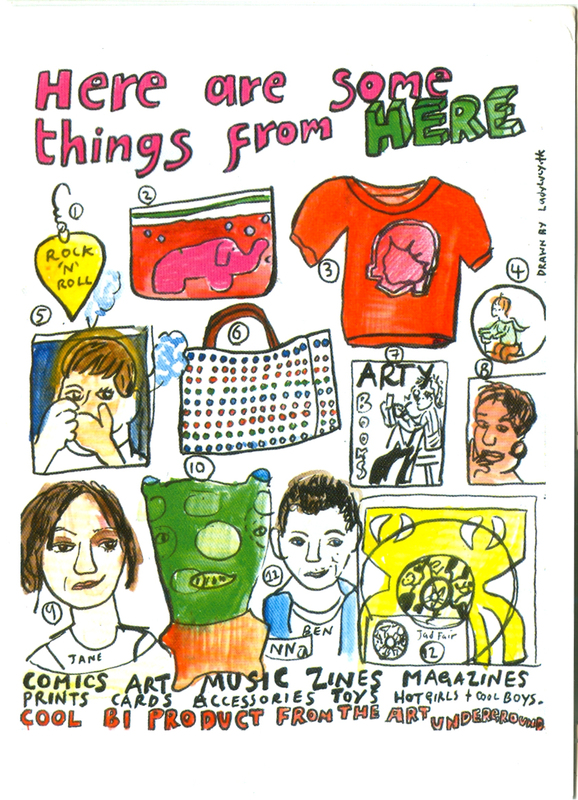 At the time, Suparak was touring with curated programs of film, video and music, and selling Some Kind of Loving as part of her tour merchandise (purchased at-cost from July). 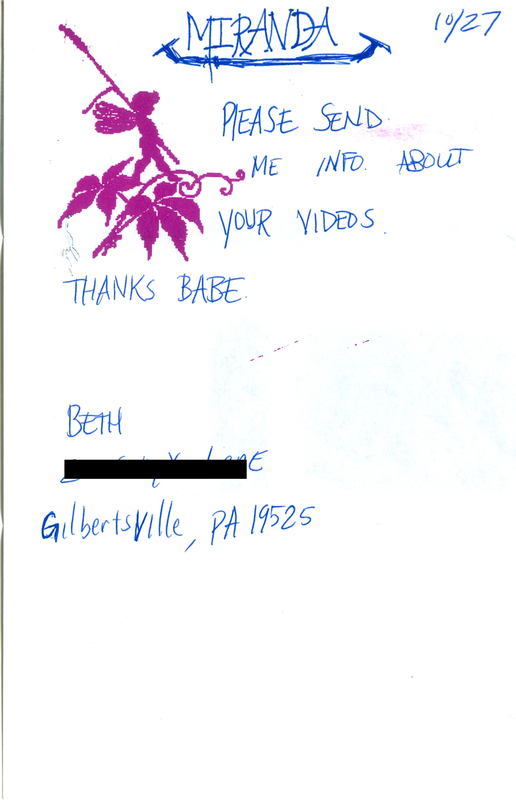 This note was written on the back of an envelope and accompanied a shipment of 47 VHS tapes. 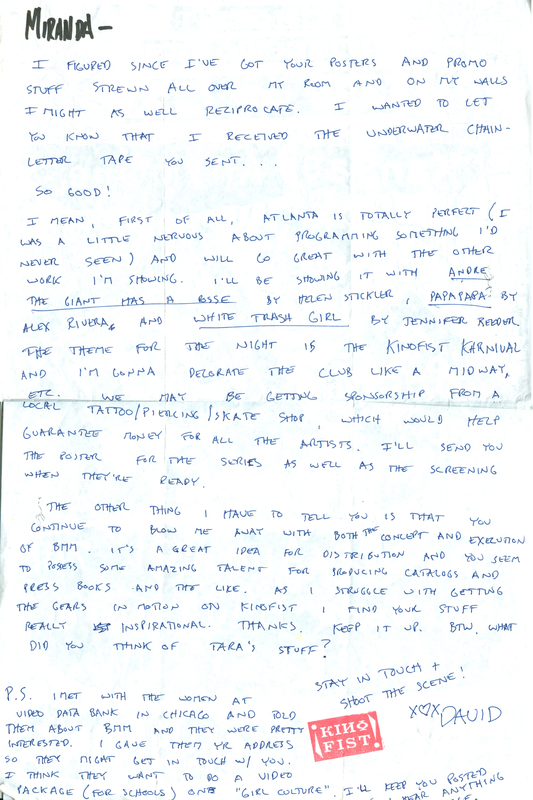 In the last sentence, July talks about selling any remaining tapes at her upcoming performance at the Kitchen in New York. 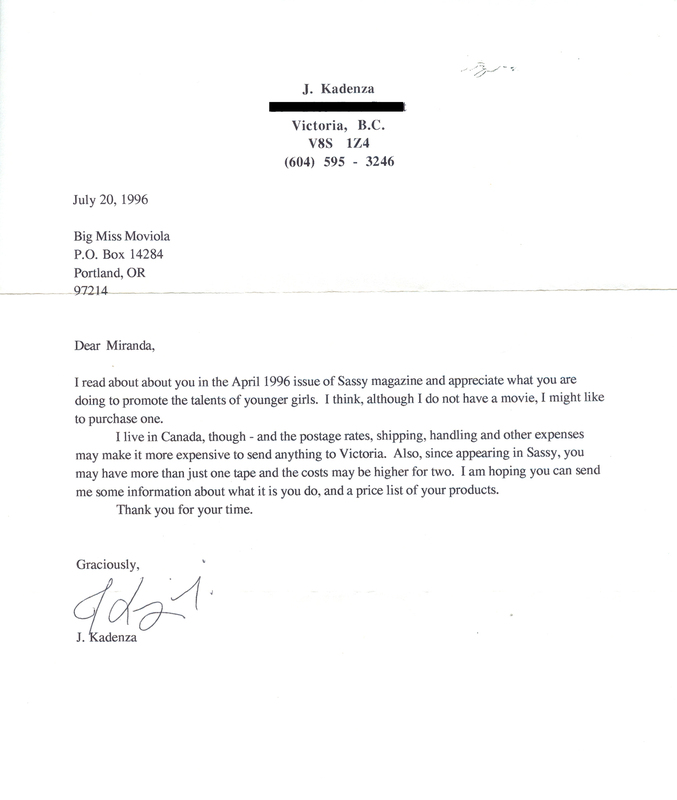 Letter from Karen Yasinsky to Miranda July. c. 2001. This letter is from an artist from the Some Kind of Loving Co-Star compilation, sent after July and curator Astria Suparak toured to launch the new video. Notes about Some Kind of Loving sales and distribution, written by Astria Suparak. August 2, 2002. From the collection of Astria Suparak. 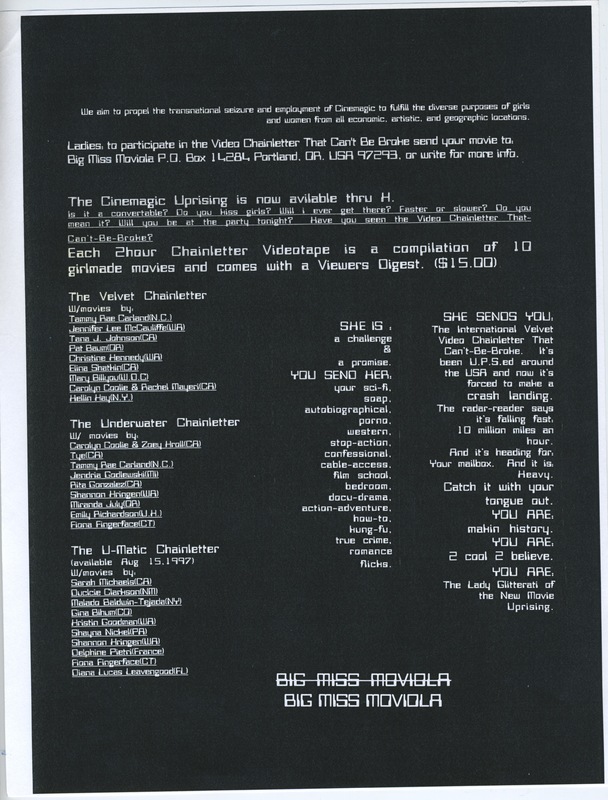 This is a list of some of the places Suparak pitched and distributed Some Kind of Loving Co-Star tapes to, including video rental and record stores, cinematheques, bookstores (Printed Matter, Spoonbill & Sugartown), and gallery and museum stores (Museum of Modern Art, The Whitney Museum, The New Museum). 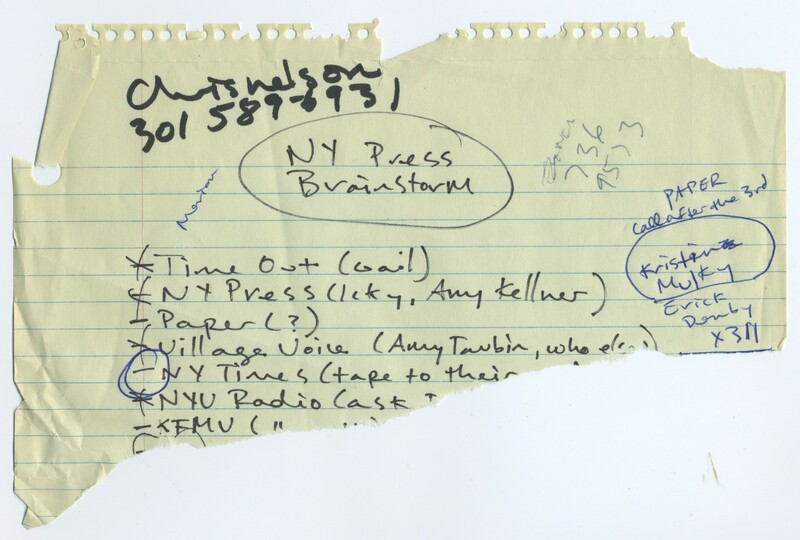 She usually dropped off the tapes in person, taking the New York subway, and would call or email a few months later to check what sold and whether more stock was needed. Listed are prices (wholesale and retail) and sales numbers. 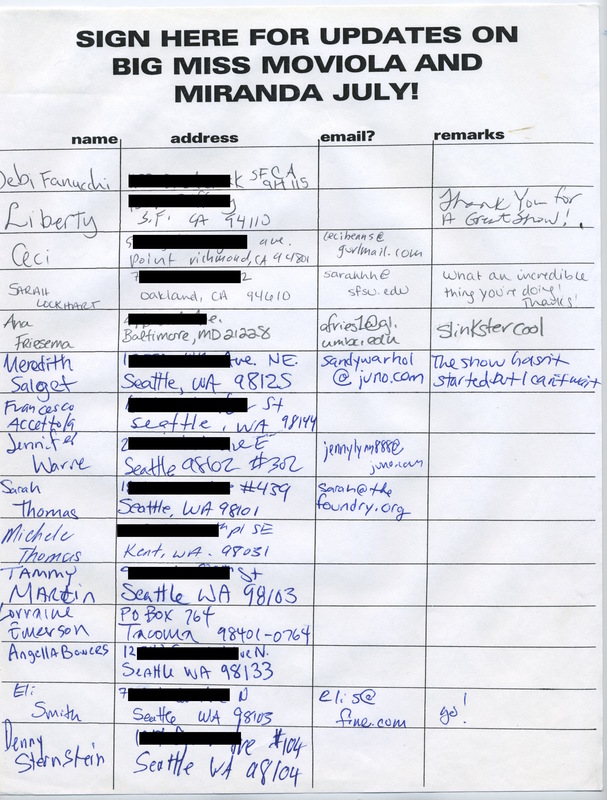 At the top is a list of people she exchanged tapes with, usually for artwork or meals, including performance artist Penny Arcade and filmmaker Sam Green. Joanie4Jackie.com homepage. February 13, 2003. 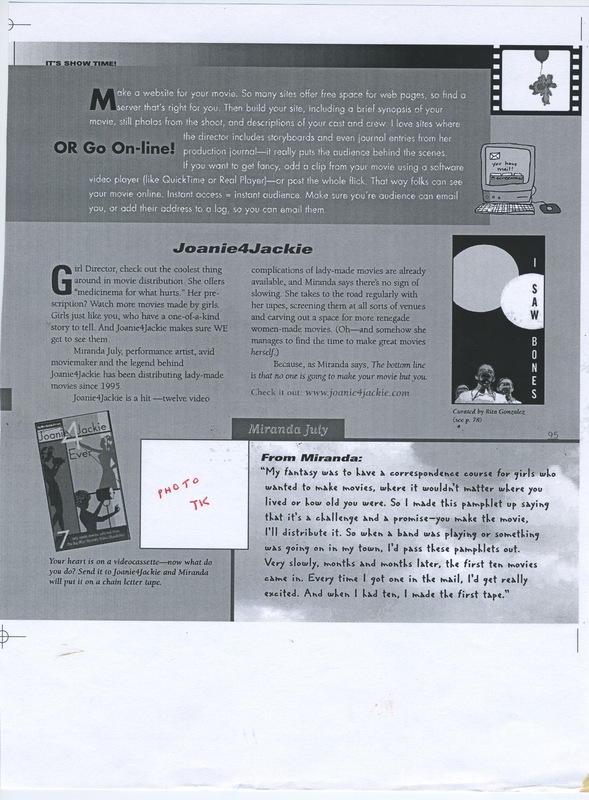 This is what the homepage looked like in 2003, when July was operating a new collaborative website, “Learning to Love You More”, along with the short-lived “How Will I Know Her” – in addition to Joanie 4 Jackie. Joanie4Jackie.com homepage. October 8, 2003. This is what the homepage looked like in 2004 when July gave the project to Bard College. 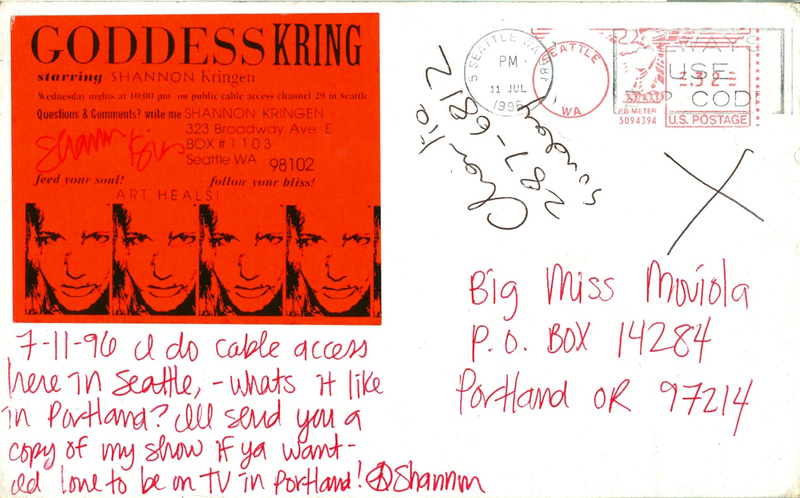 Postcard from Shauna to Vanessa. c. 2007.